Hi friends! I hope you’ve missed me. Life’s been just a little crazy lately, ya know, raising a tiny human, buying a house, all that good stuff, but I’ve missed chatting with you in this little corner of the Internet and I’m going to make a sincere effort to be better about checking in. 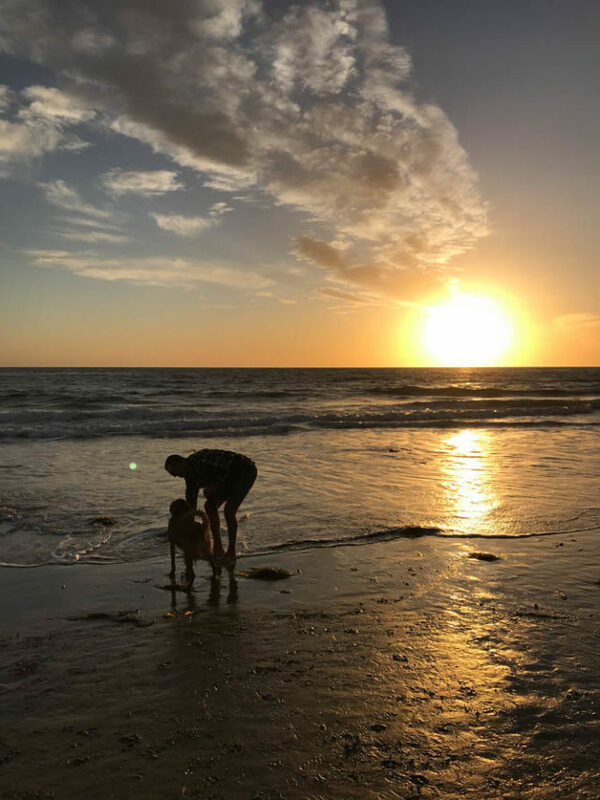 Today’s post is one I’ve been wanting to write since January, but it required just a little bit of field research on my end and goodness knows how difficult even the tiniest of outings can be when there is a small babe involved. As you’ve probably heard, Santa Barbara County got hit HARD this winter. 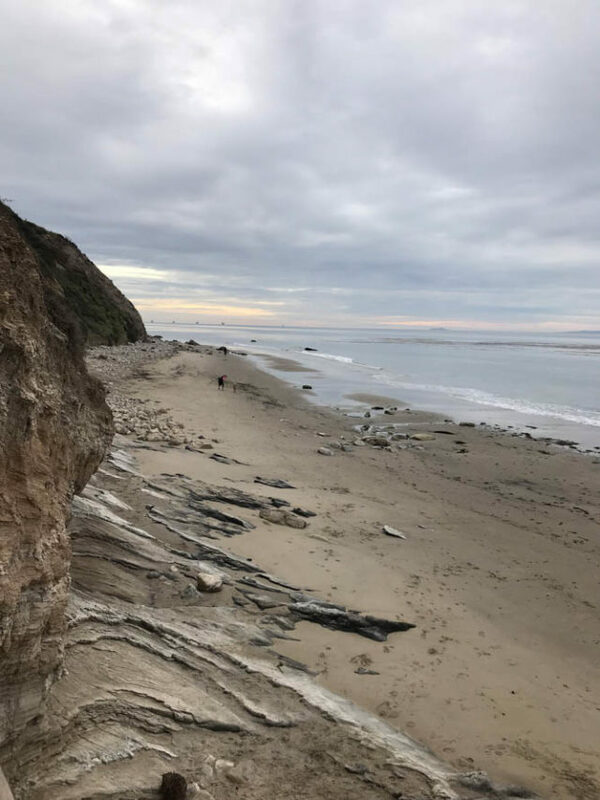 First there was the Thomas Fire, followed shortly thereafter by the Montecito Mudslide, both of which caused massive evacuations, homes lost, injury and death. They hit our little towns hard, and an area once known for its plethora of local businesses is now facing more vacant storefronts than it has seen in a long, long time. 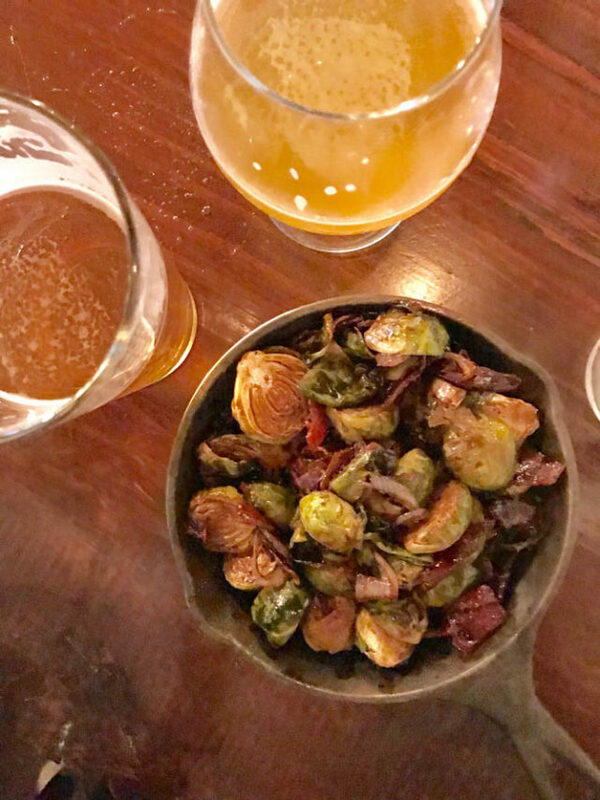 While I was hearing about all of these great places being forced to lay people off, cut back hours or completely close their doors to business, I realized that, although I am passionate about sharing my favorite restaurants, wineries and breweries when I’ve traveled to other cities, I’ve never featured some of my go-to spots in my own town. And, in these uncertain times, they certainly deserve to be recognized now more than ever. 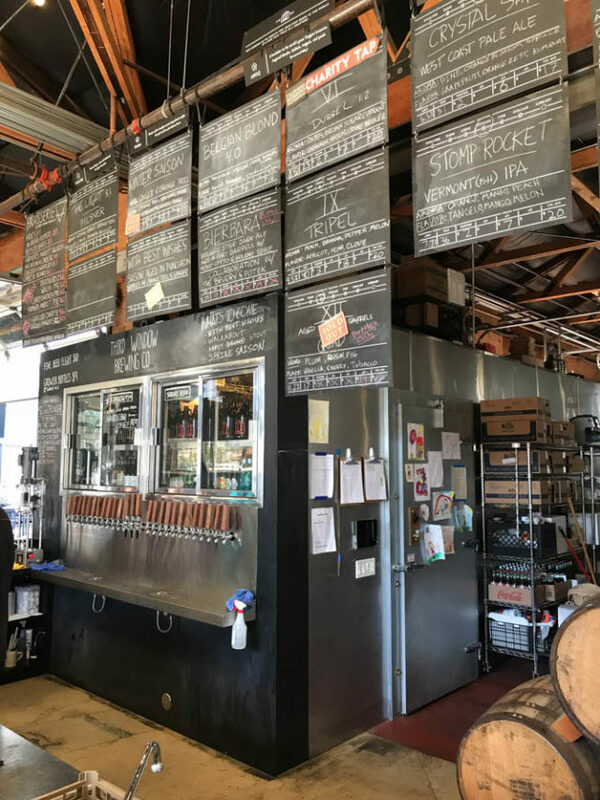 If you’re headed to the Santa Barbara area in the near future, I urge you to check out as many of these local eateries and drinking establishments as possible. And if you haven’t been here yet, I think it’s about time you planned a trip! 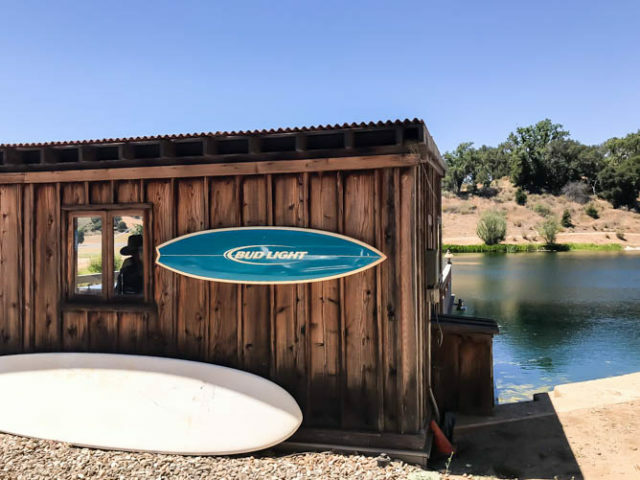 It’s a beautiful little oasis in the middle of California that is truly one-of-a-kind. They don’t call it the American Riviera for nothing! Full disclosure: I haven’t had the opportunity to stay here yet, but let me just tell you I like what I see. The entire Hotel Californian property (which also includes numerous restaurants and storefronts) is reinvigorating a recently humdrum State St. It’s beautifully decorated, classy and did I mention their rooftop pool? 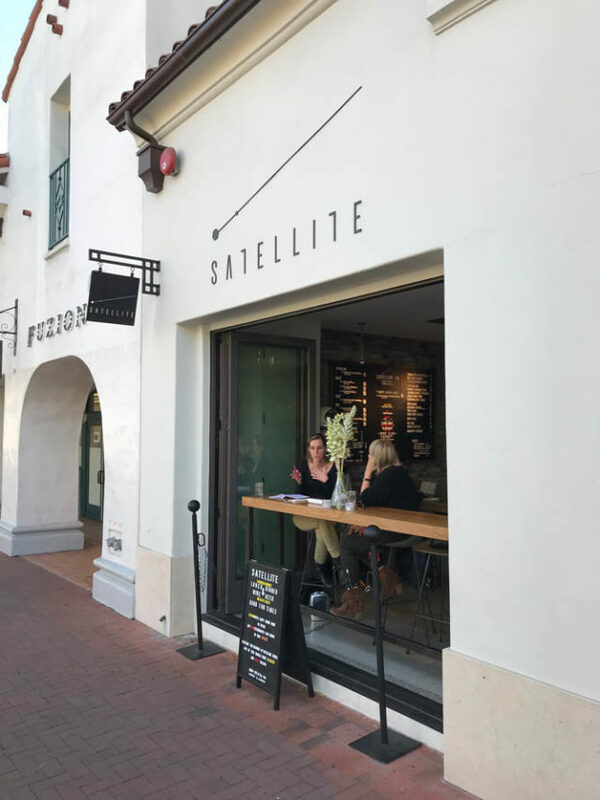 I’ve eaten at (and enjoyed) the first two eateries they’ve opened, Blackbird and Goat Tree SB, and I think the entire area could be just what downtown Santa Barbara needed. 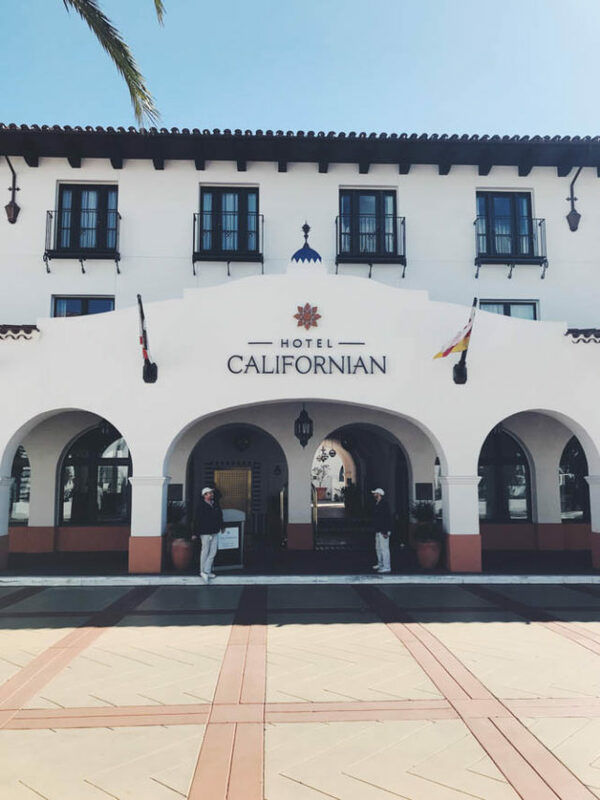 Formerly The Fess Parker – A DoubleTree by Hilton Resort, I have to give my former employer a mention because there are BIG things happening here. As you can probably guess by the name change, the hotel is going through a huge rebranding. They’ve been remodeling the lobby, meeting and guest rooms to give the resort an updated, beachy feel and I can’t wait to check them out now that the official name change has taken place. All I can say is thank goodness we finally have a bakery with a legit storefront in town! 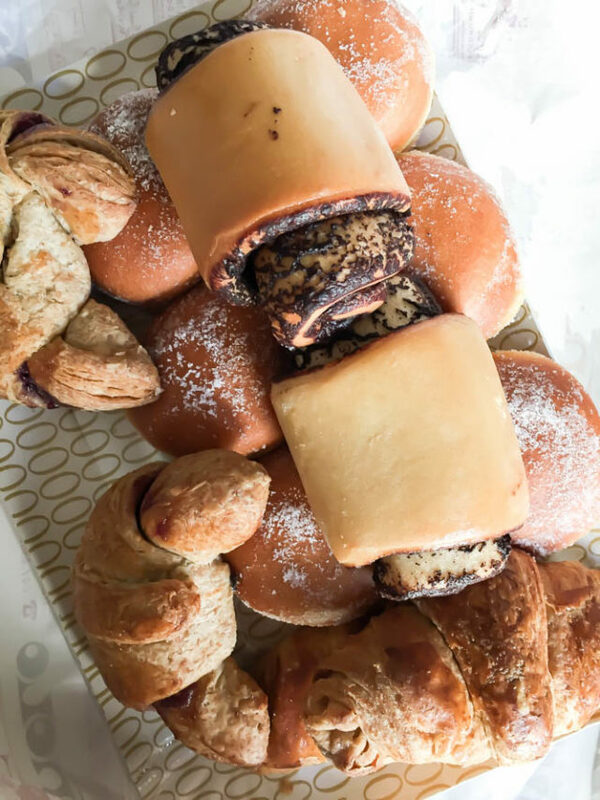 Helena Ave. Bakery offers a consistent selection of fresh bread and delicious baked goods as well as a huge assortment of grab-and-go lunch options that are perfect for a day of wine tasting or brewery hopping in Santa Barbara’s Funk Zone. 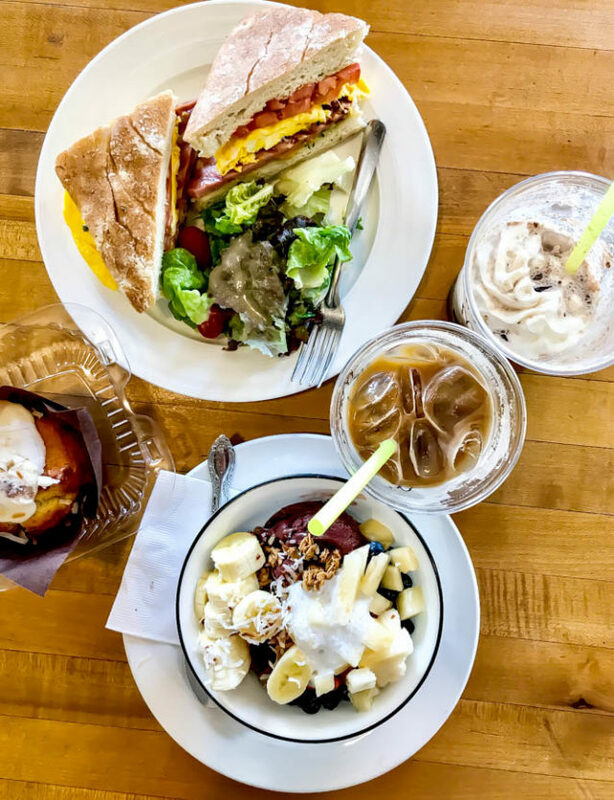 Another Funk Zone gem, Lucky Penny is the place to go for tasty wood-fired pizzas, bountiful salads and hearty sandwiches. 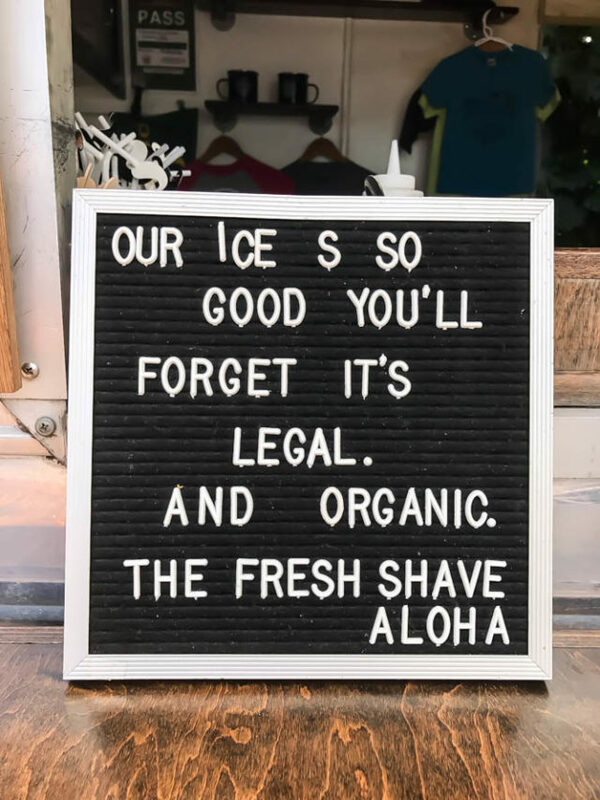 And did I mention they also sell frozé? 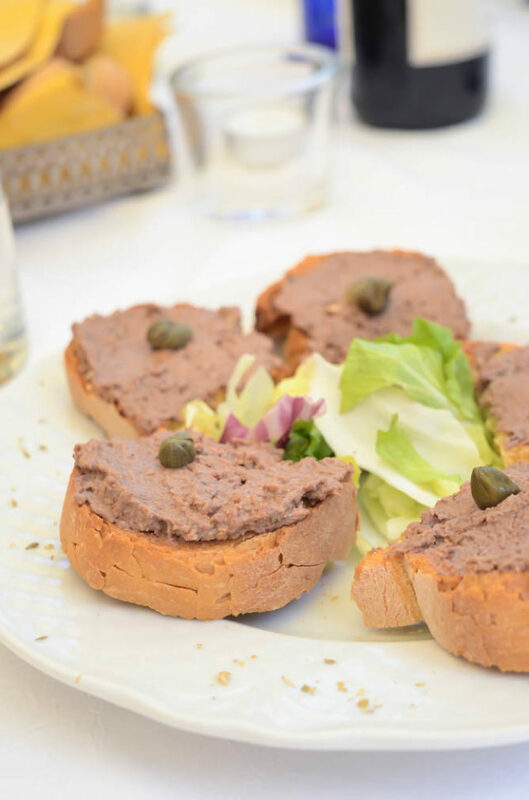 You also must try the mushroom bruschetta appetizer. I’m working on my own version to post on the blog as we speak! 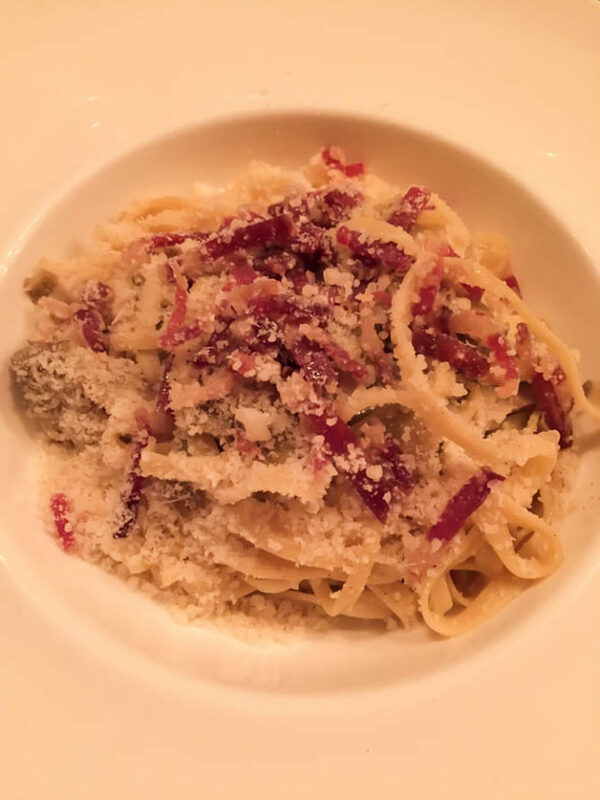 Of course, I have to mention the hubs’ and my very favorite restaurant for date night, whenever we have guests in town, birthday or anniversary, or any other celebration we can think of. 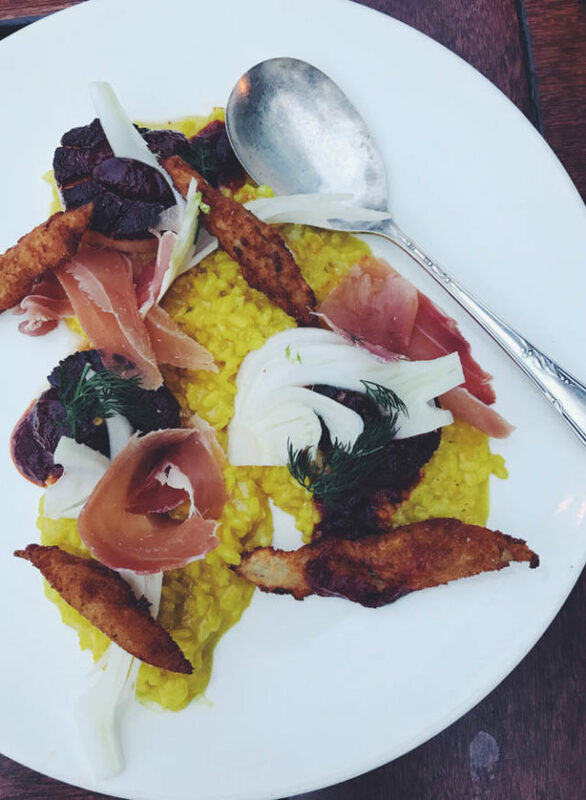 Seriously, we’ve tried so many other “nicer” restaurants in town and nothing compares. 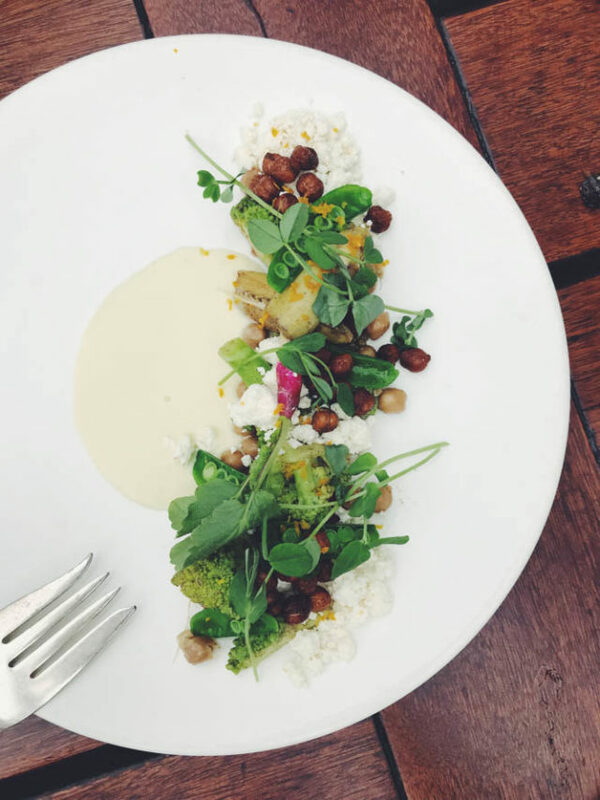 Aside from the Brussels sprouts (which are OMG to-die-for and ALWAYS on the menu) the Lark’s menu changes seasonally yet never disappoints, and everything is served family style, so you get to taste a little bit of everything! 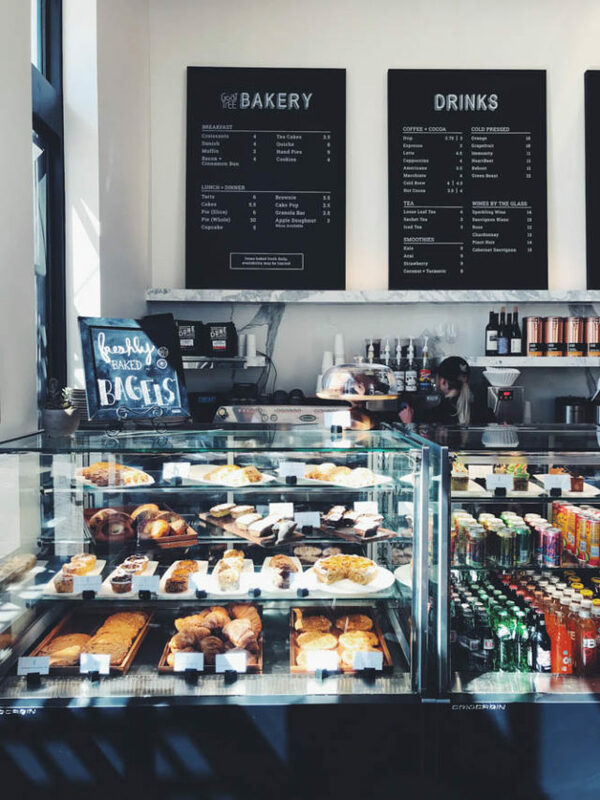 I also should mention that Helena Ave. Bakery, Lucky Penny and The Lark are all related, so it’s no wonder they all made my list of top places to visit! 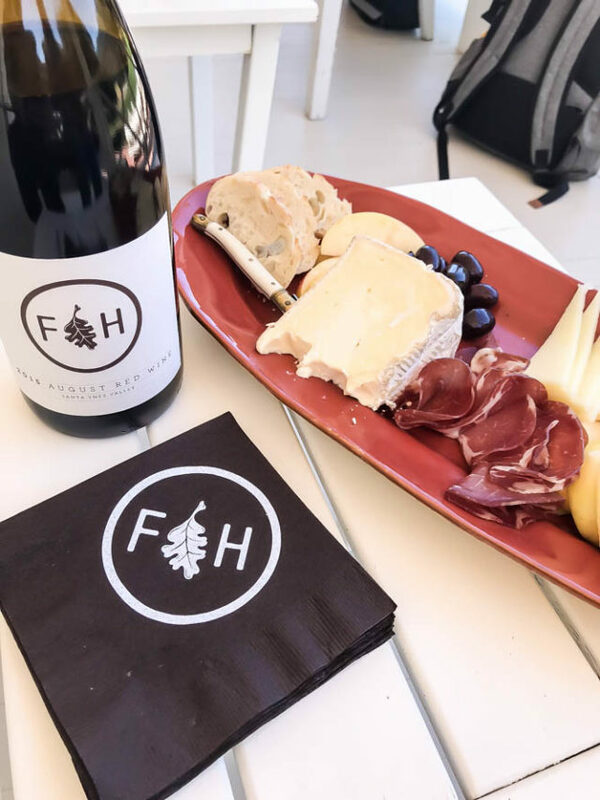 I couldn’t leave out Santa Barbara’s hippest new wine bar that offers a delicious farm-to-table menu to boot! 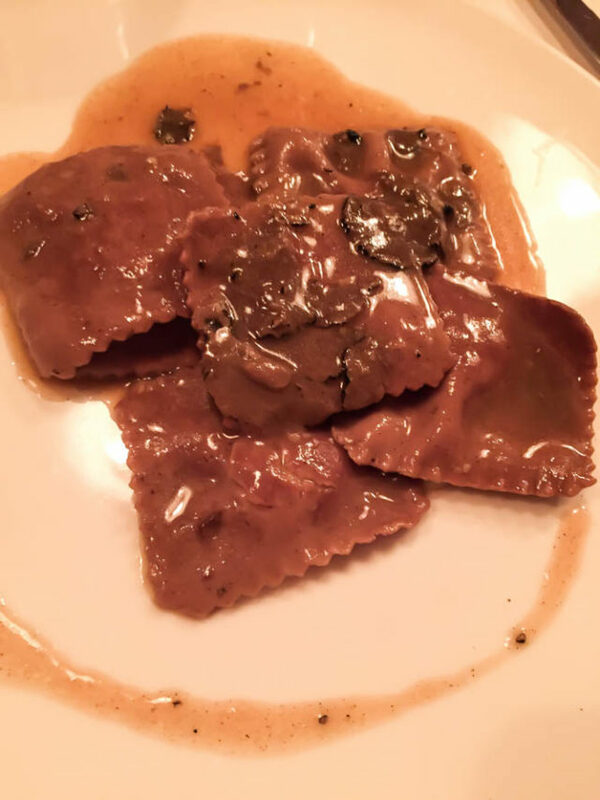 I love this place for its unique, sometimes kooky wine selections, blind tasting night and veggie-heavy food items that change based on weekly Farmer’s Market offerings. Yoga Pants Salad, you have my heart! 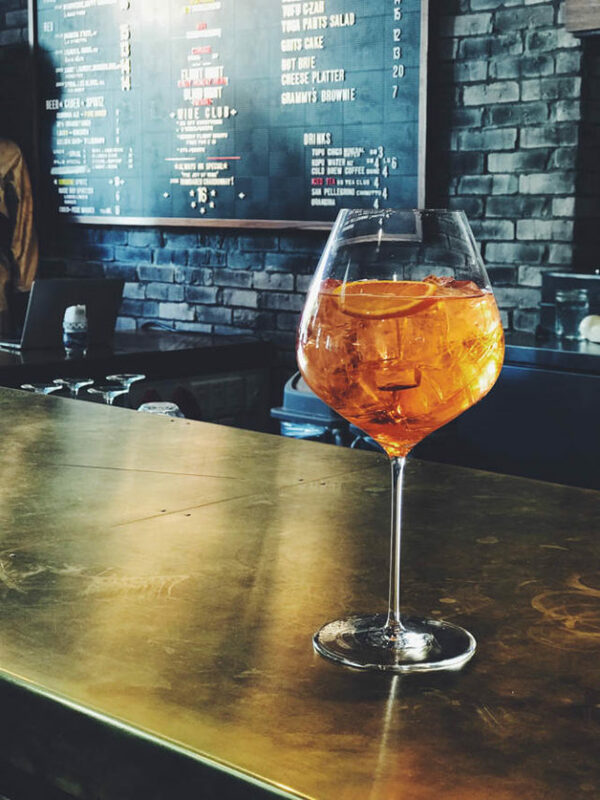 The Spritz is a must-try at Satellite! This used to be our “neighborhood joint” when we lived at our old place, and you can bet we’ll still be making regular visits even though we live a bit further away now. It’s locally owned with a great wine and beer selection and tasty pub-like food. They also offer brunch on the weekends, have a patio (yay for dog-friendly establishments!) AND we feel perfectly comfortable bringing the little babe with us. So many bonuses! 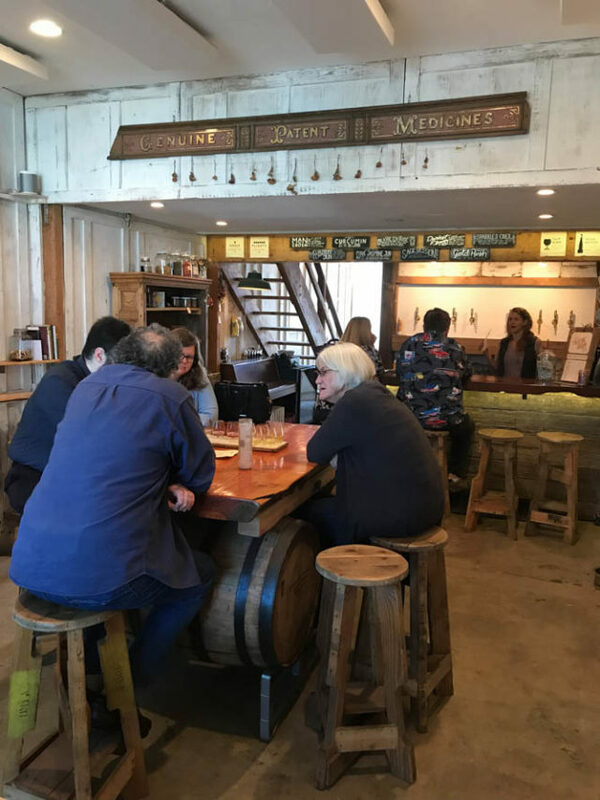 Santa Barbara is home to its share of breweries, that’s for sure, but Third Window consistently stands out to us. Even with a frequently rotating menu, the beers are consistently top-notch and, unlike many of today’s newest breweries, they are NOT solely focusing on IPA’s, which is perfect for me since I’m not much of a hops fan! 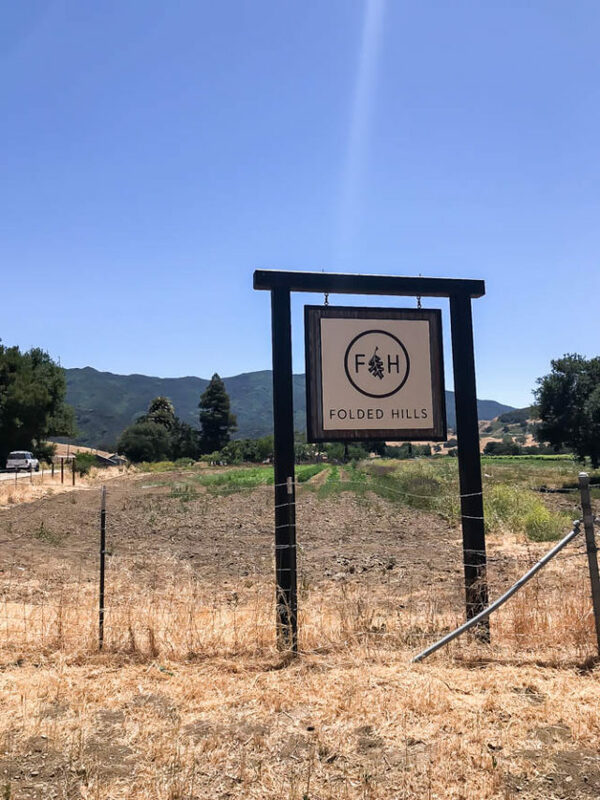 I’m so glad I stumbled across this gem of a tasting room! 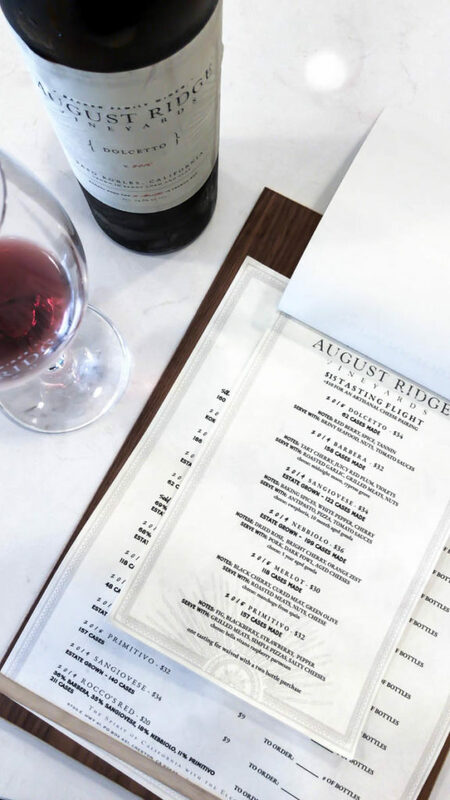 With its main winery and tasting room in Paso Robles, August Ridge recently opened a smaller tasting room downtown, just off La Arcada. 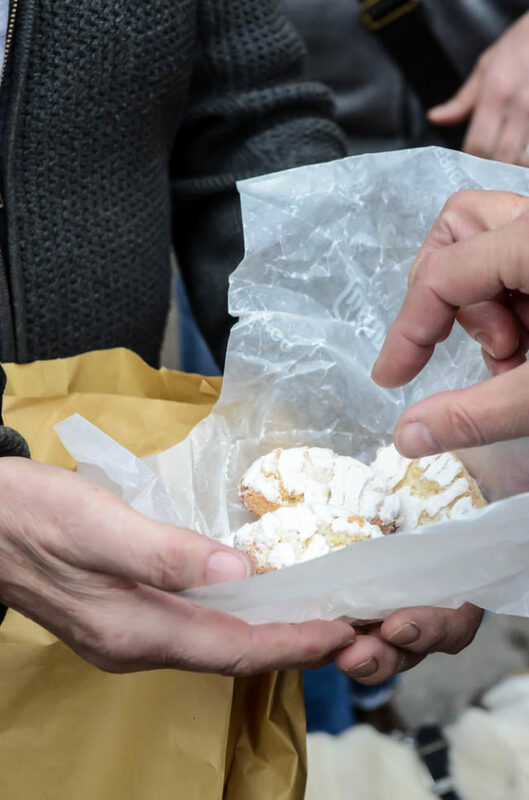 Because they specialize in Italian varietals, they’re a welcome change from Santa Barbara Wine Country’s largely Pinot Noir and Chardonnay focused repertoire. I’ve loved everything I’ve tasted from them and need to plan another trip back soon to restock! 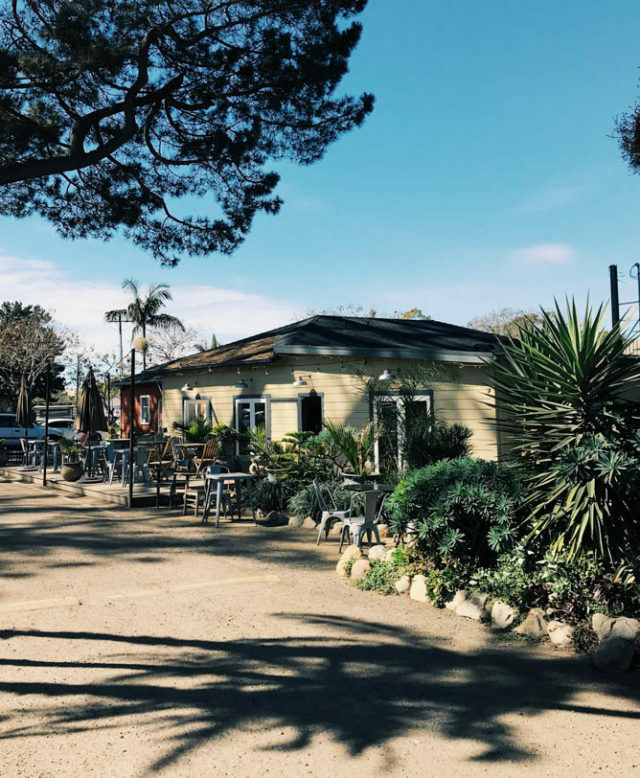 Handlebar Coffee has been a Santa Barbara establishment for many years, but its newest location on upper De La Vina Street has everyone abuzz. 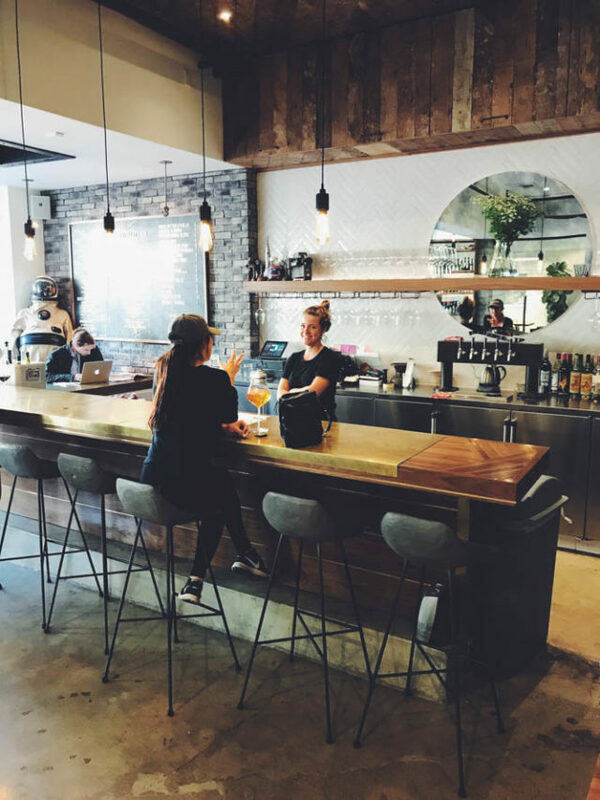 It’s much bigger than the downtown location, with a great outdoor seating area, a full-service kitchen to make tasty breakfast and lunch offerings, plus beer and wine on tap! They also do lots of fun pop-ups and benefits for local organizations. We have yet to attend any but we hope to soon! 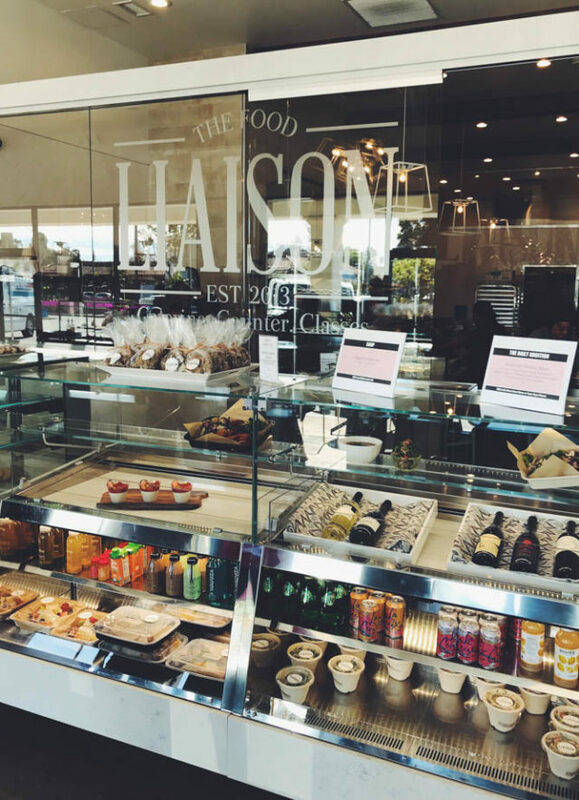 If you’re a cheese lover like me, you’re not going to want to miss this stop. I was so happy when what started as a small, local cheese and wine shop that hosted my favorite annual Sparkling Wine & Cheese Pairing Class every year tripled in size to open its own café, only to see it have to shutter the restaurant portion after this winter’s hardships. I have high hopes they’ll once again be able to operate in their full capacity, but until then you can still buy lots of delicious goodies at their shop and support a great local business at the same time! I’m not going to lie, I’m pretty jealous that Carp has this awesome food establishment in its repertoire. You know I’m all about balance and tasty, quality food, and TFL delivers on all fronts. 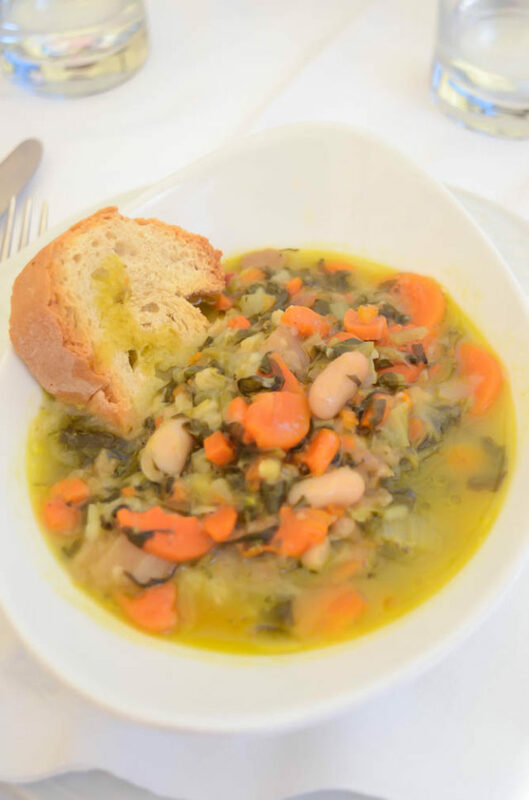 They offer plenty of vegan and gluten-free dishes, but also plenty of non-special diet items…and it is all soooooo good! 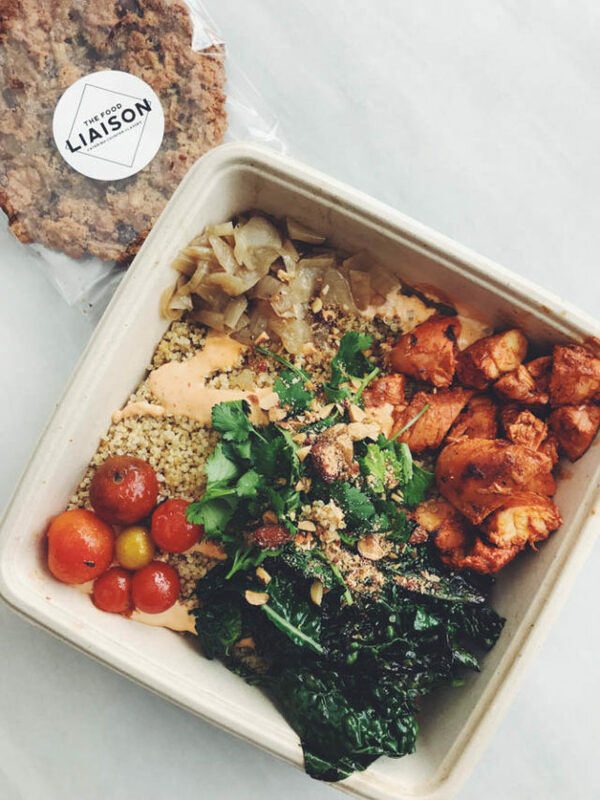 Not only do they serve lunch Monday-Friday (try the Crack Bowl…it will not disappoint) they also have a stellar catering program AND offer cooking classes. I know where I’ll be eating lunch every time I’m in the area! 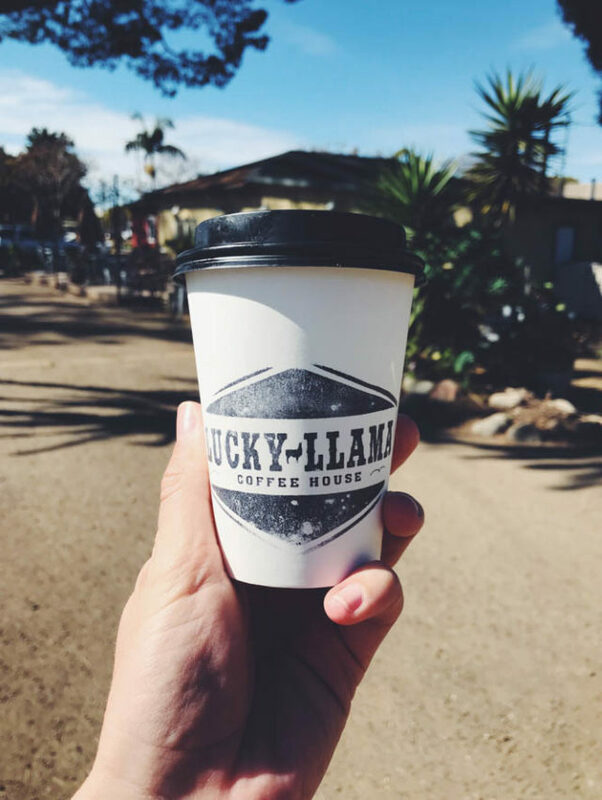 Okay, Lucky Llama is probably THE cutest little coffee shop in Santa Barbara County. 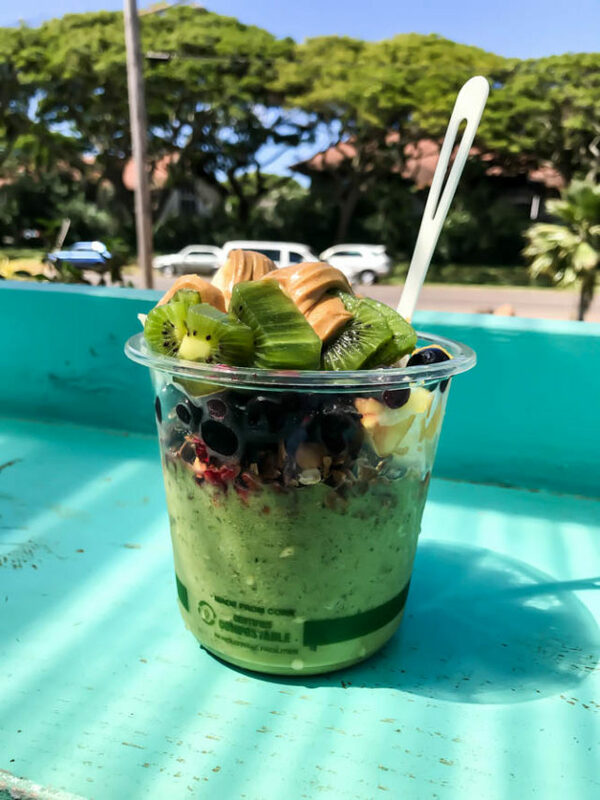 Their coffee drinks are top notch, but they also make delish acai and oatmeal bowls. It’s the perfect place to plop down with your laptop and get some work done or meet a friend to catch up on the lovely outdoor patio. Plus, it’s totally kid-friendly, which I’m learning to appreciate more and more these days! What a one-of-a-kind tasting room! 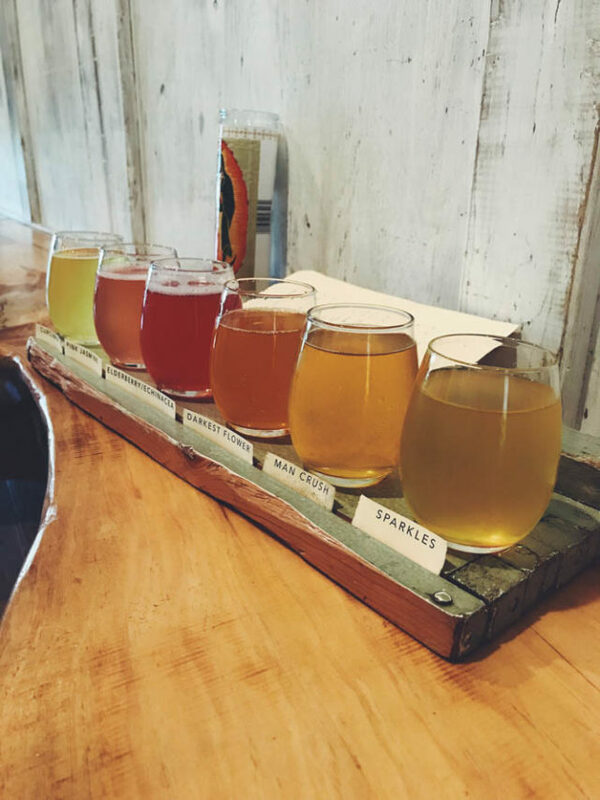 The Apiary specializes in mead but also offers ciders and lots of other interesting fermented elixirs. 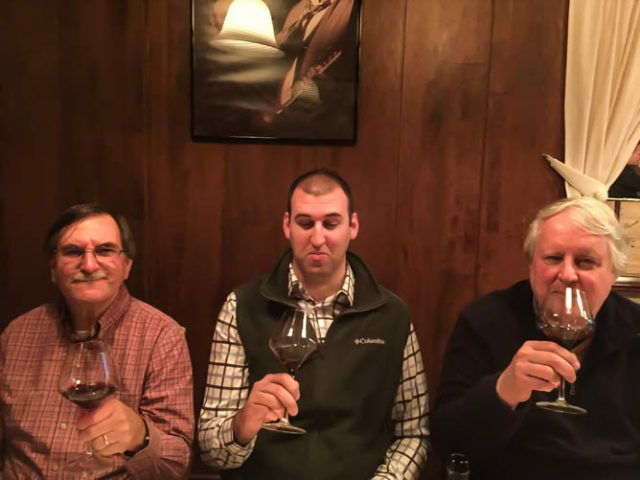 My dear friend @gojohannogo and I shared the tasting flight and it was the perfect way to take a little foray into the world of mead and everything related. I’m not sure I’d be able to drink large quantities of the different options, but it was so fun to experience all the different flavors. 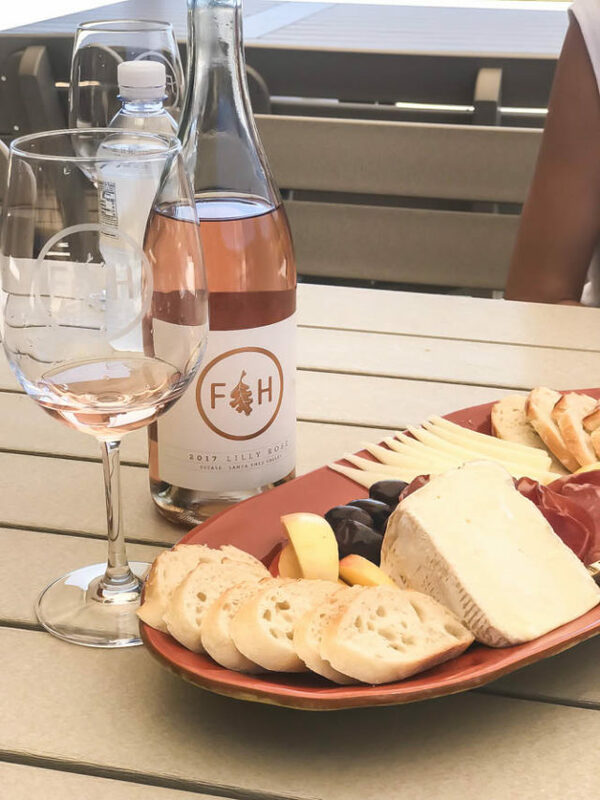 Definitely pay them a visit if you’re looking for a change-up from your average winery or brewery! Our favorite pre-Costco shopping trip stop for a refreshing beverage. They have lots of entertaining names for their beers like Meat & Potatoes Porter! Another great (newer) brewery in the Goodland that’s always sure to have a food truck or live band on hand, especially on the weekends. It’s also got some good outdoor space and is kid-friendly! 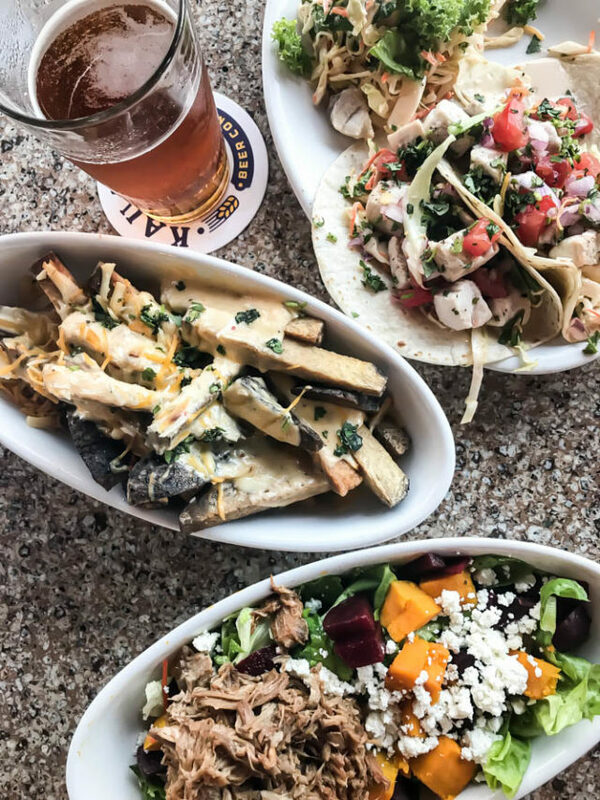 This hip little eating and drinking establishment at a Holiday Inn turned Kimpton hotel is just what Goleta (“the Goodland”) needed. 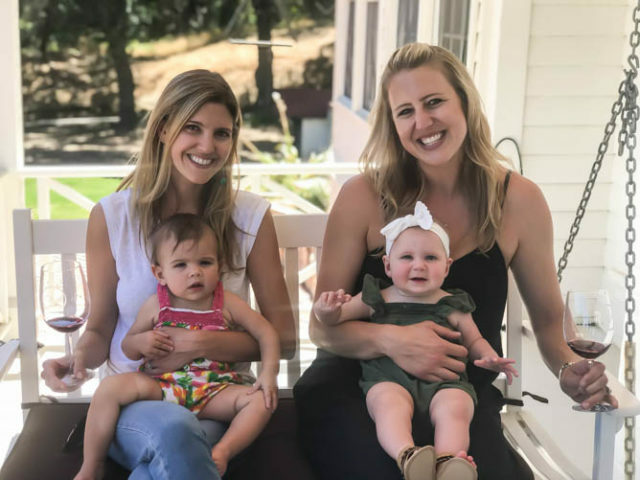 It’s a great spot for Happy Hour or brunch, and another one we feel completely comfortable bringing the baby to. If you’re lucky to visit on a Sunday during the summer, you might just catch a raging pool party, live DJ and all! These are all just a few of my favorites, and I’m sure there are some places that I missed. If you know of any, please leave them in the comments below! I’m all about supporting local right now and love discovering new places. Until next time! 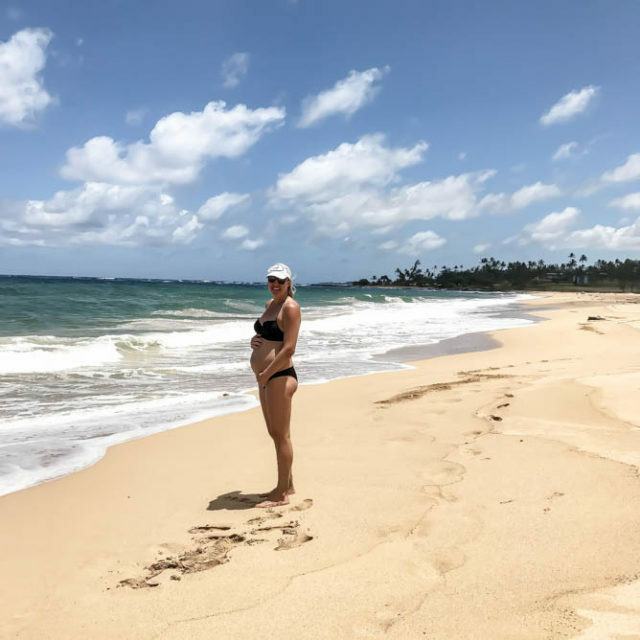 Time for my Travel Diaries: Kauai recap!! 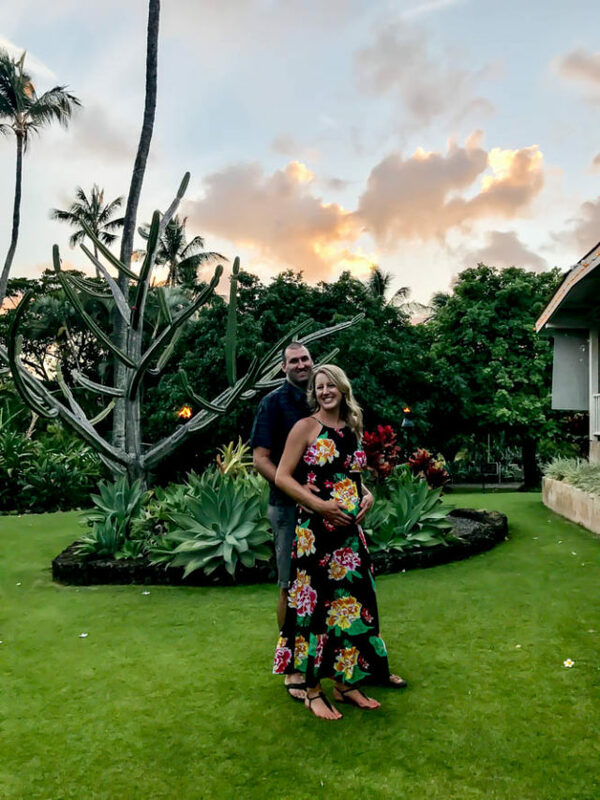 It seems like there are lots of you planning a trip to my favorite Hawaiian island soon, so I didn’t want to waste any more time in putting out a post that includes some of our favorite things we did while we were there for our babymoon/make-up honeymoon in July. Without further ado, here’s the scoop! After some research and price comparison, we decided to stay at the Sheraton Kauai Resort. 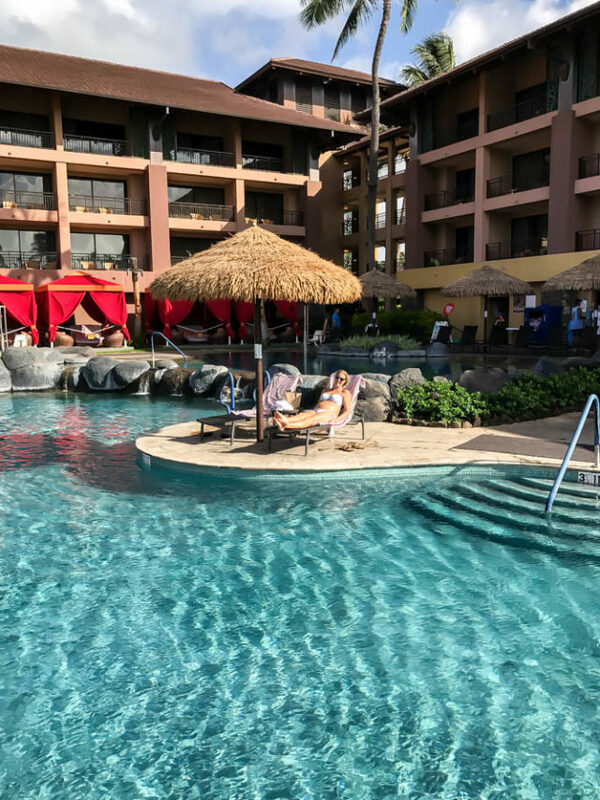 We had been heavily considering the Kauai Marriott Resort since I had stayed there before with my family and LOVED it, but after looking at all of our options and considering all the extra costs we’d be incurring, we decided to go with the Sheraton. TIP: When booking a hotel, especially in really “resort-y” areas, be sure to consider additional costs such as WiFi, parking, resort fee, etc. when looking up rates. One resort may seem way cheaper than another, but once you add in all the extras you could be at exactly the same price (or more) as the more expensive one! Overall, we were really happy with our choice. We sprang for an Ocean View room (which I highly recommend) and were on the second story overlooking the pool and the beach. 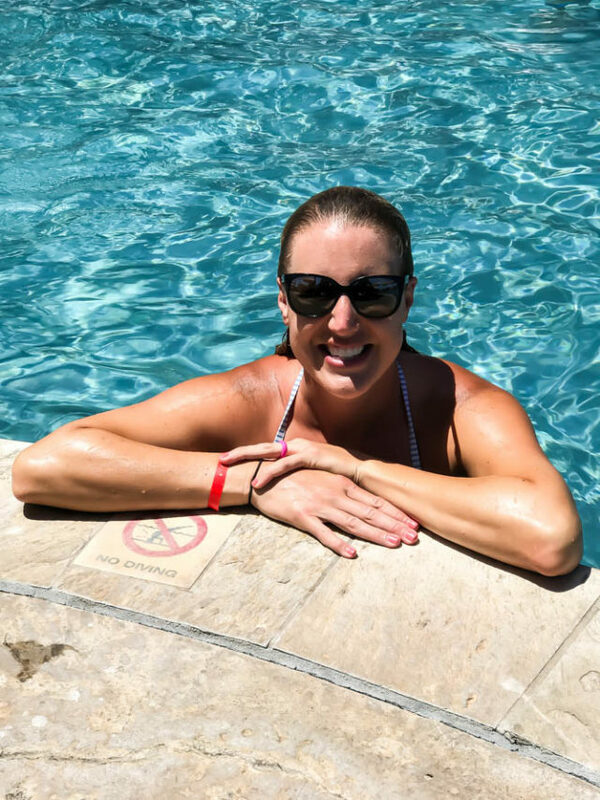 If you’re staying here, be sure to sign up for the Starwood Rewards program, as it’s free and you’ll receive a ton of perks such as discounted parking, free upgraded WiFi, discounts on all meals eaten on property, etc. Since our days were mostly broken up by location, I’m going to break it down this way and share what we did/ate/saw in every little area we visited. A small, historic town about 40 minutes northeast of Poipu, just north of Wailua Falls/Wailua Beach. 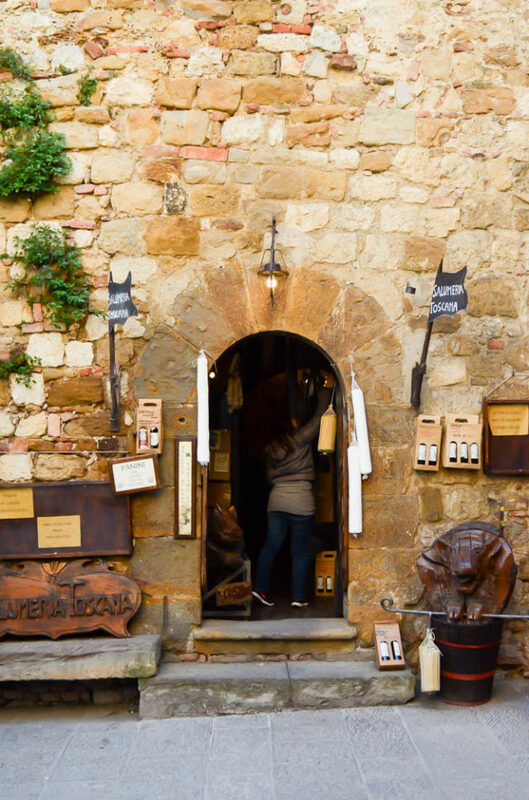 There are so many gems here – shops, eateries and hikes alike – that I definitely recommend visiting! 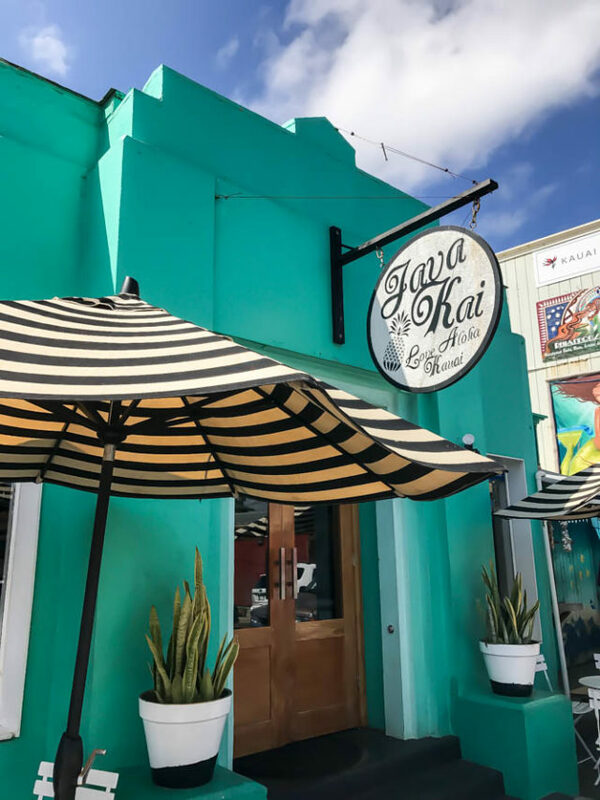 Java Kai – The cutest little coffee shop you ever did see! 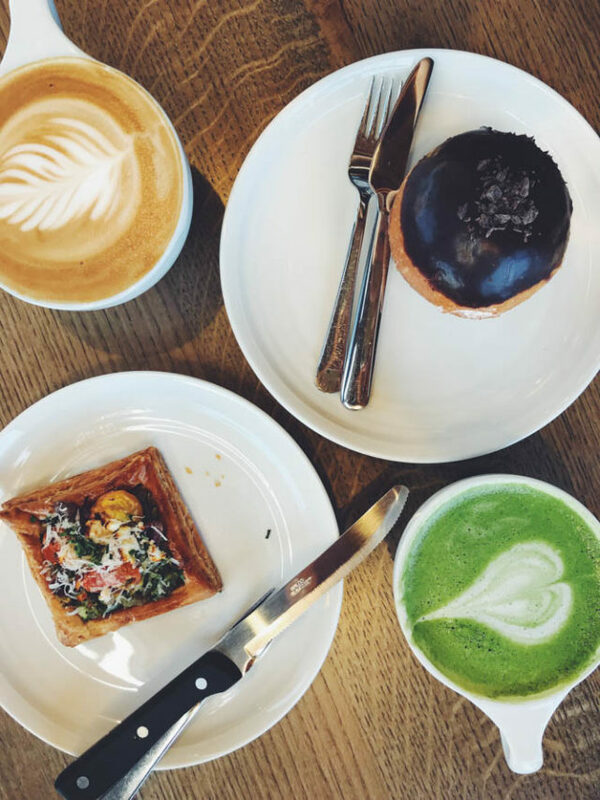 In addition to inventive coffee drinks and delicious baked goods, they have a full breakfast and lunch menu and everything I saw coming out of that kitchen looked AMAZING. I fell in love with their Macadamia Nut Latte and proceeded to order some macadamia nut milk from Amazon as soon as I got home to make my own version. There’s also a really cute shop attached to Java Kai called Shipwrecked that has tons of adorable, locally made products that you may just max out your credit card for. 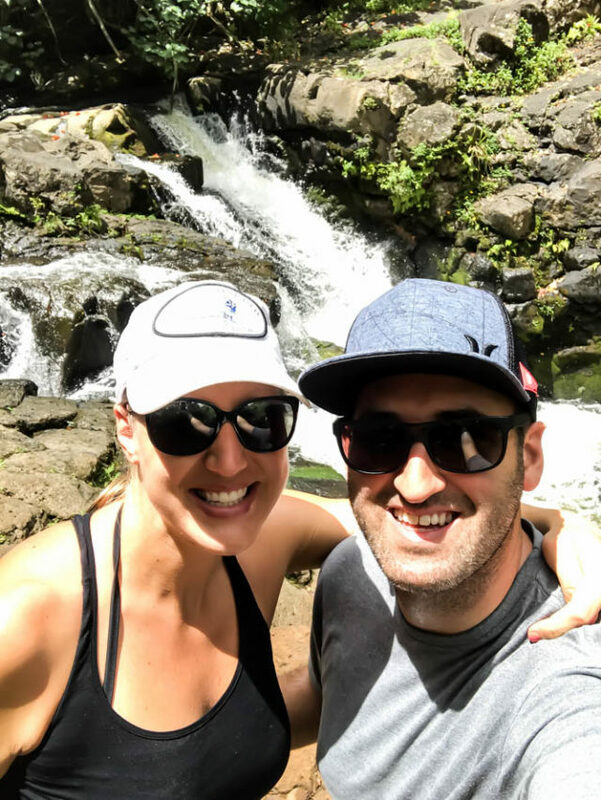 Ho’opi’i Falls – We decided to check out this hike after it was recommended to us by the gal at Shipwrecked (see above.) It’s a nice mellow one, where you hike along the water. We didn’t make it all the way to the big falls (there was some pretty low clearance for us tall people) but we found some little ones that were still cute. It was a good, easy way to get us back into hiking shape since we haven’t done it in a while! 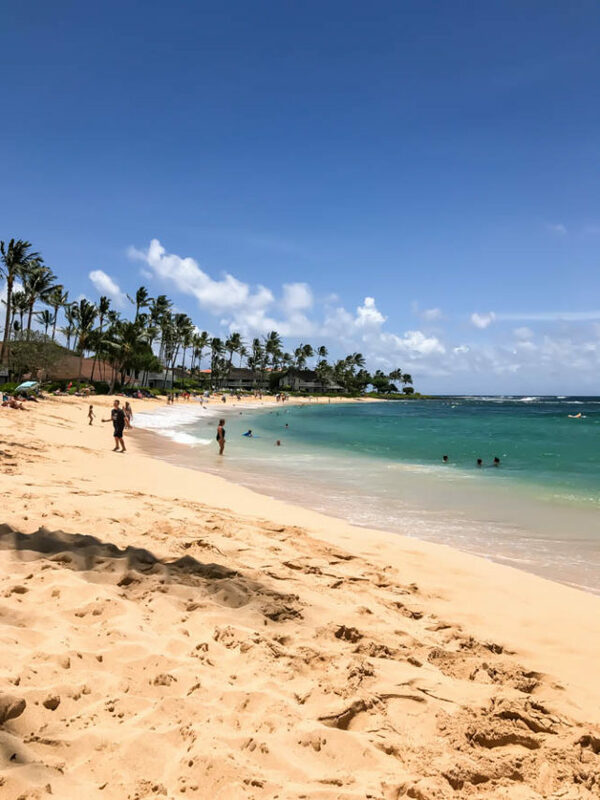 Wailua Beach – Probably our favorite beach of the trip. It’s huge, and wasn’t very crowded when we were there on a Friday. The water was so lovely to just float around in (especially after our hike to the falls), with decent enough waves (not scary, though) for the hubs to try his hand at some body surfing. Wailua Shave Ice – Our first shave ice (of many) of the trip. 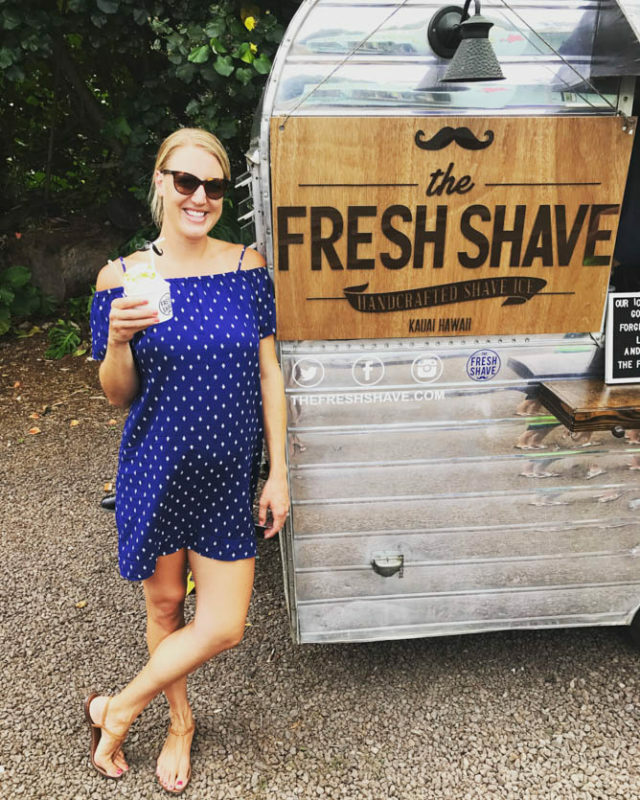 I loved how so many shave ice trucks in Kauai were using fresh fruit juices and purees to flavor their ice rather than the heavily dyed/sugary stuff. This was no exception! 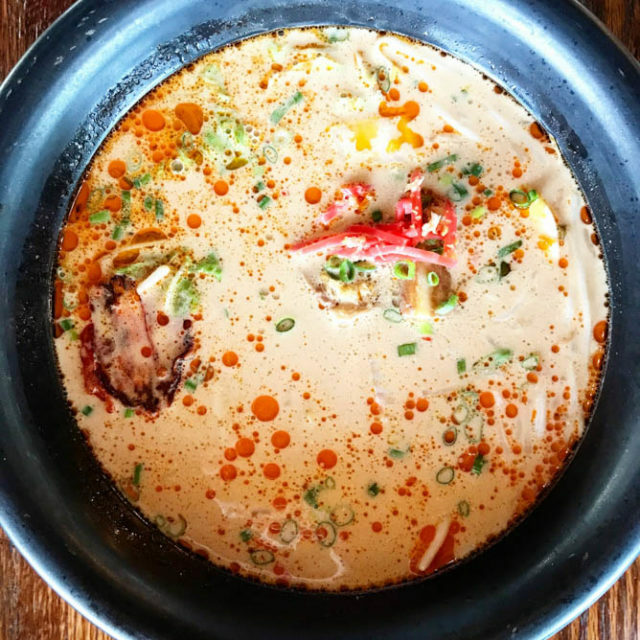 The Local – Our only regret here was that we were only there for Happy Hour, which meant a limited food menu to choose from. Nevertheless, we were impressed! 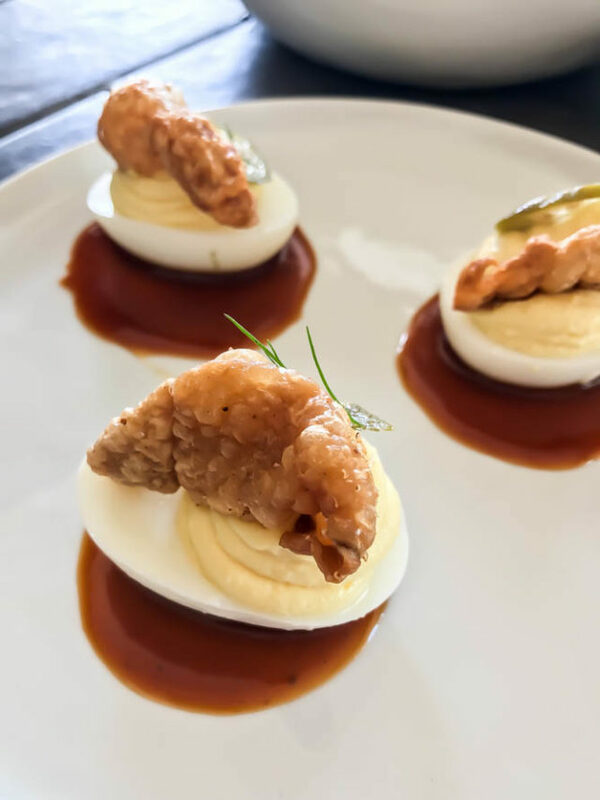 We ordered the Deviled Eggs with Crispy Chicken Skin, some French fries with homemade dipping sauces and of course drinks (a delicious coconut water mocktail for me and a Mai Tai for the hubs.) If you caught my Bacon and Goat Brie Pizza with Vanilla Passion Fruit Jam I posted the other week, this restaurant was the home of my inspiration! 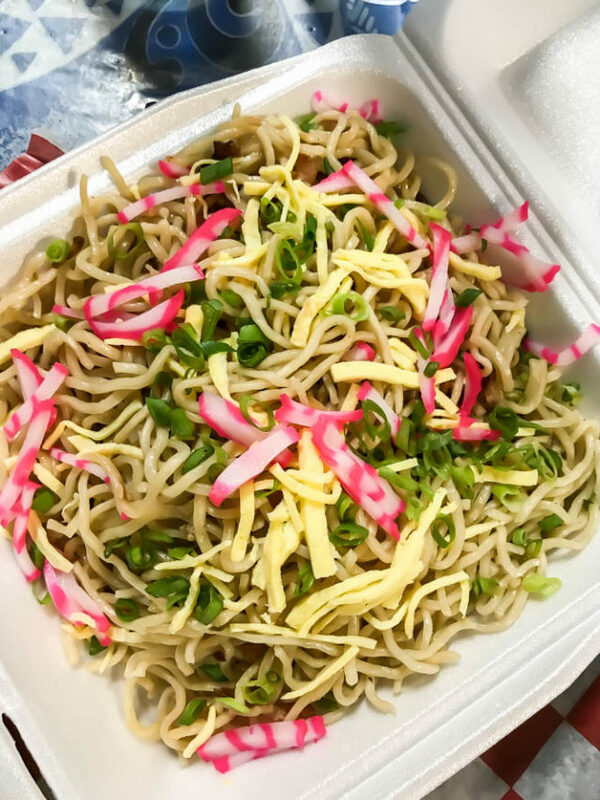 Based on my cousin’s recommendation, we hit up Hanapepe on Friday night for their art market/food truck night. Although we didn’t spend too much time here, the town is super cute and comes alive on Fridays. Definitely worth a stop through if you have time! 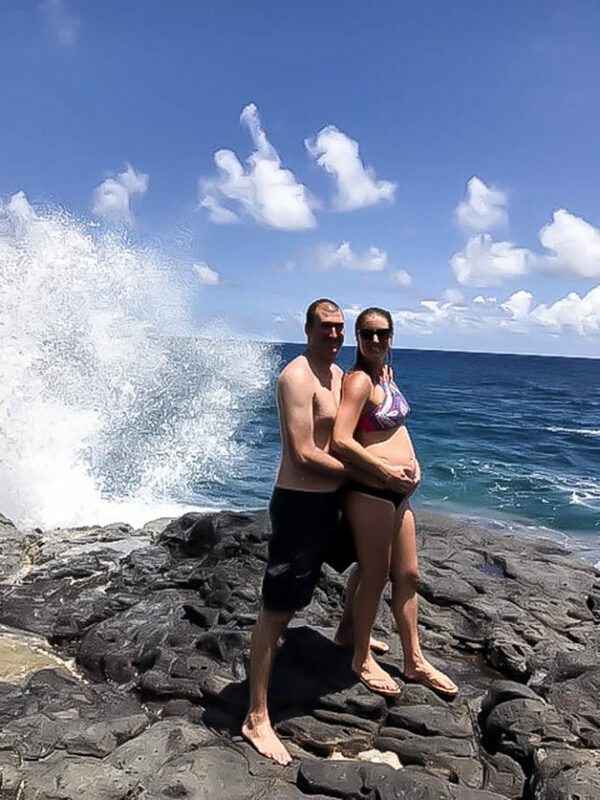 Our next adventure was up to the North Shore to do some hiking/beaching/exploring. It was fun to see the other more populated area of the island, and there are definitely some gems to check out. 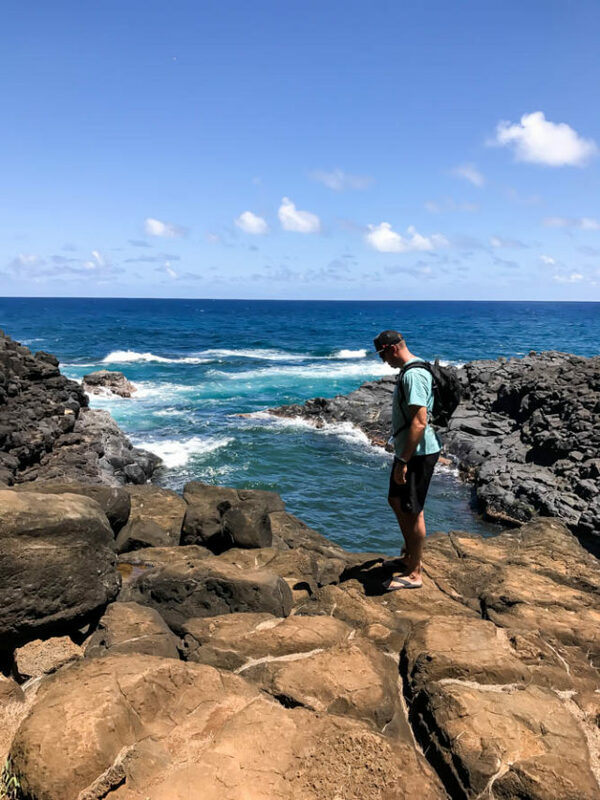 Queen’s Bath – This was recommended to us by a few of you, and I’m so glad it was! It’s such an amazing sight to see and really not too difficult to get to (even pregnant). My advice would be to go on a weekday and go early. We ended up having to park a ways away and hike in (since the trailhead is in a residential area and they have very strict parking rules) and it was a little crowded when we were there, but it was still fun. Also, it’s safest to go when the surf report for the North Shore is under three feet, otherwise it can get a little dangerous! Be sure to look at a map of the area before going, as there are some other “pools” on your way that you can technically swim in, but aren’t nearly as safe. 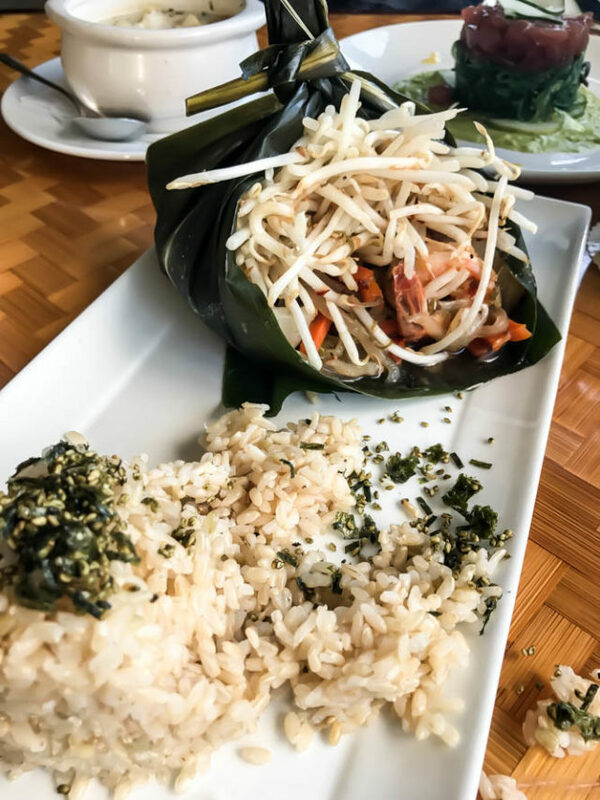 Kalypso Island Bar & Grill – We had no recommendations for restaurants in Hanalei, so popped into Kalypso on a whim. We sat at the bar and were not disappointed. 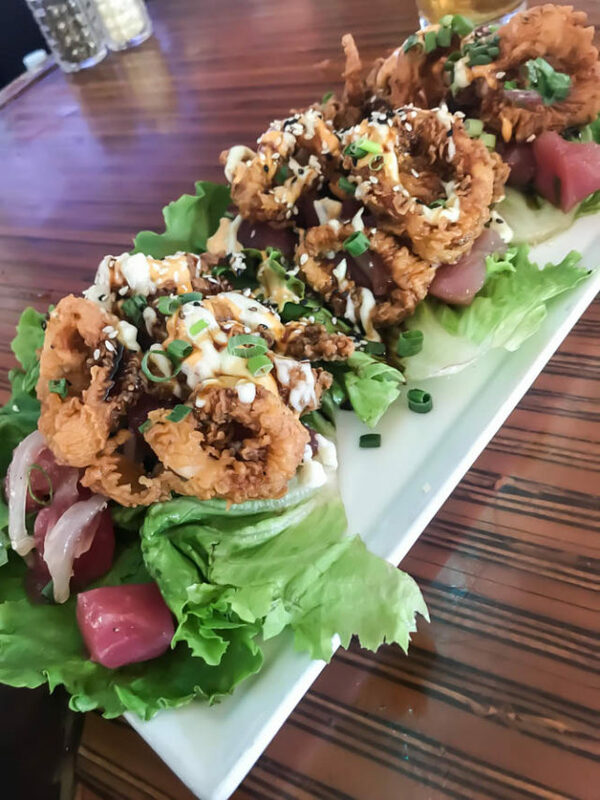 In fact, Chris had one of his highlight meals of the trip here: Poke and Calamari Lettuce Wraps! 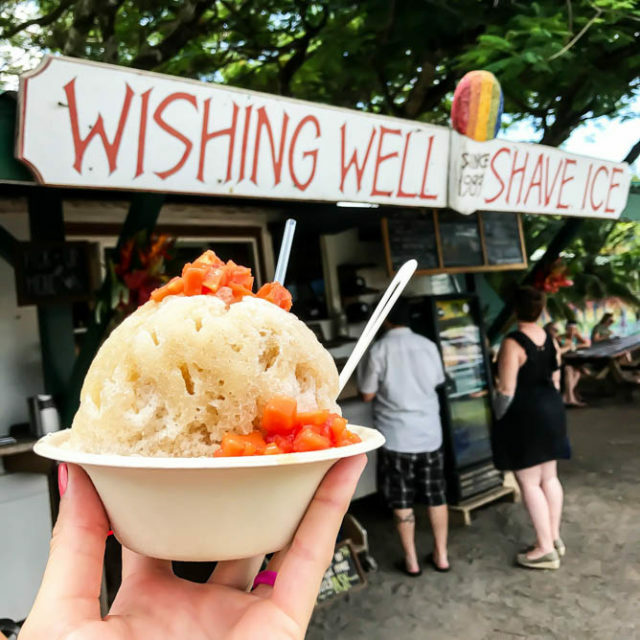 Wishing Well Shave Ice – We most definitely did not miss any shave ice on this trip, and I’d have to say that this one was probably my favorite. 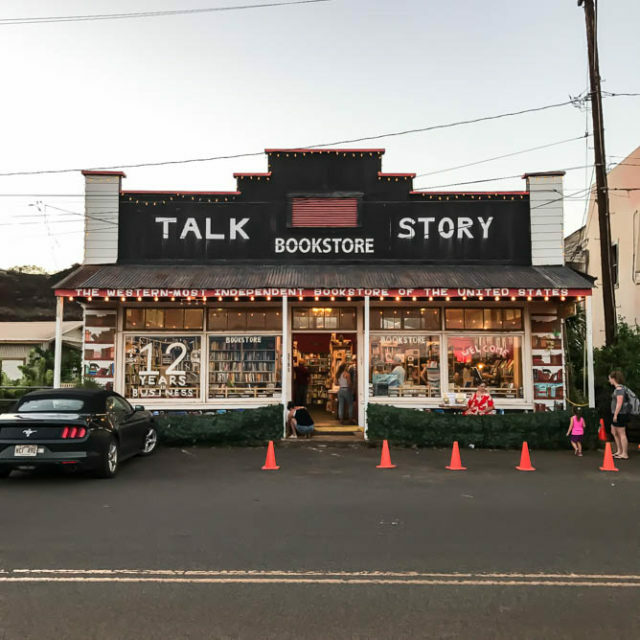 Another local favorite, definitely hit it up if you are in Hanalei at any point during your trip! 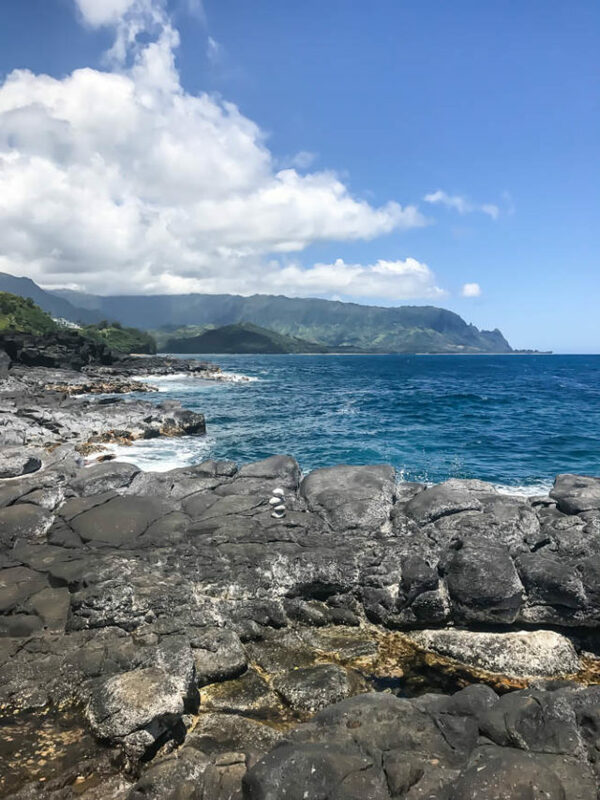 Anini Beach – A small, fairly secluded beach near Kilauea, we stopped here on our way home from Hanalei and it was lovely! The sand was a tad rocky, but it was very mellow and we enjoyed just relaxing, even if there were no fish to see or waves to surf. A cute little hidden gem if you’re not one for crowds! 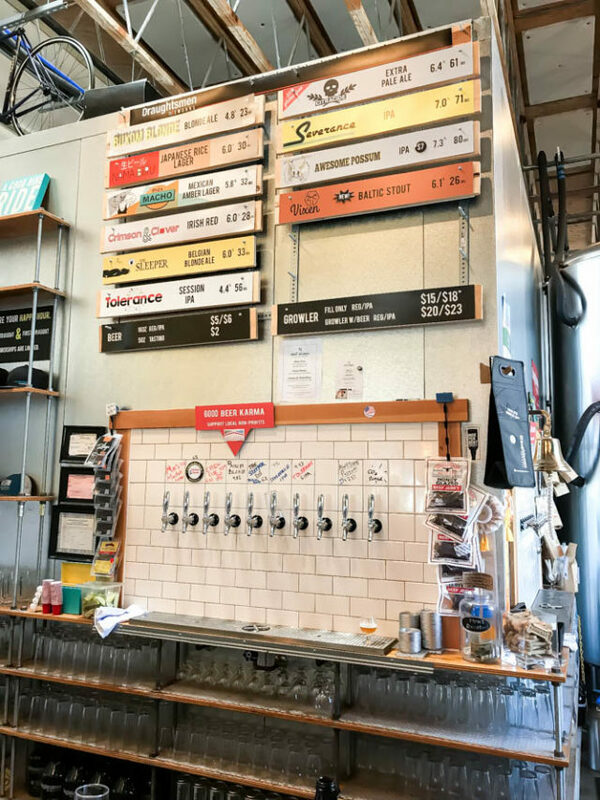 Kauai Beer Company – We didn’t spend too much time in Lihue, but we did make the 30-minute or so drive from our hotel one night to try out Kauai Beer Company. I’m so glad we did! Although I can’t say much for the beer, I LOVED their Taro Fries (Cheesy Style!) and the Beet It! Salad was just what I needed after a few days of over-indulgent eating. Keoki’s Paradise – A fairly “tourist-fied” restaurant that was right near our hotel, it’s basically a Duke’s with a different name. Still a solid place to grab a good seafood or steak dinner, though! Plantation Gardens Restaurant – A restaurant that looks exactly like its name, we had some good, high-quality local food here and multiple photo ops to boot! It was also very close to our hotel, so we could walk to and from which was really nice. Brennecke’s – To be honest, this was probably one of our least favorite restaurants of the trip. We thought it was pretty overpriced for the quality, and unfortunately the ocean views didn’t quite make up for it. 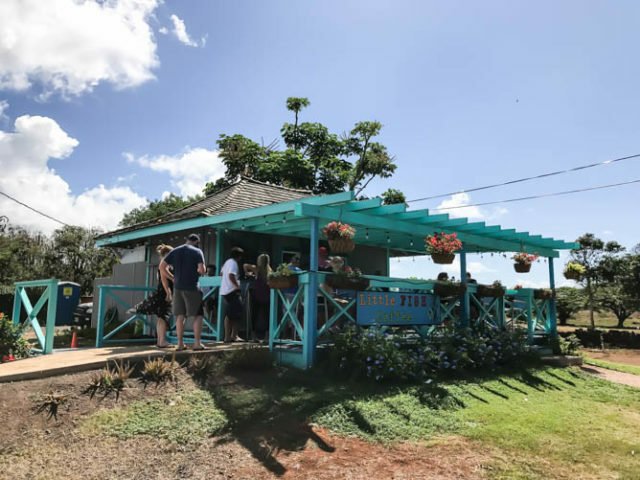 Little Fish Coffee – If there’s one thing Kauai has plenty of, it’s cute coffee shops! This one was in walking distance to our hotel and, although they don’t have quite the huge menu selection that Java Kai does, what they do serve is on point. I got a massive green acai bowl and Chris got a smoothie and bagel sandwich. Can’t go wrong with any of those! 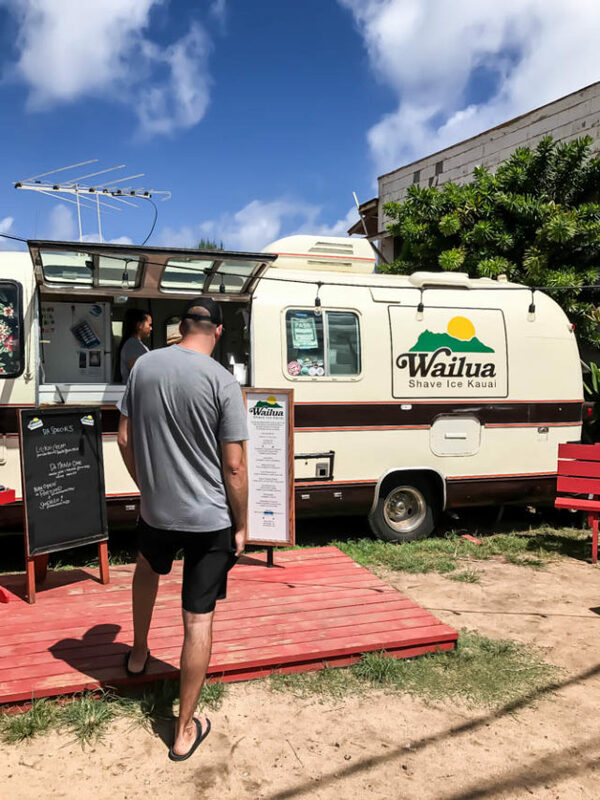 Warehouse 3540 – This fun little coop of art vendors and food trucks is technically located in Lawai, but it’s so close to Poipu that I just decided to lump it all together. 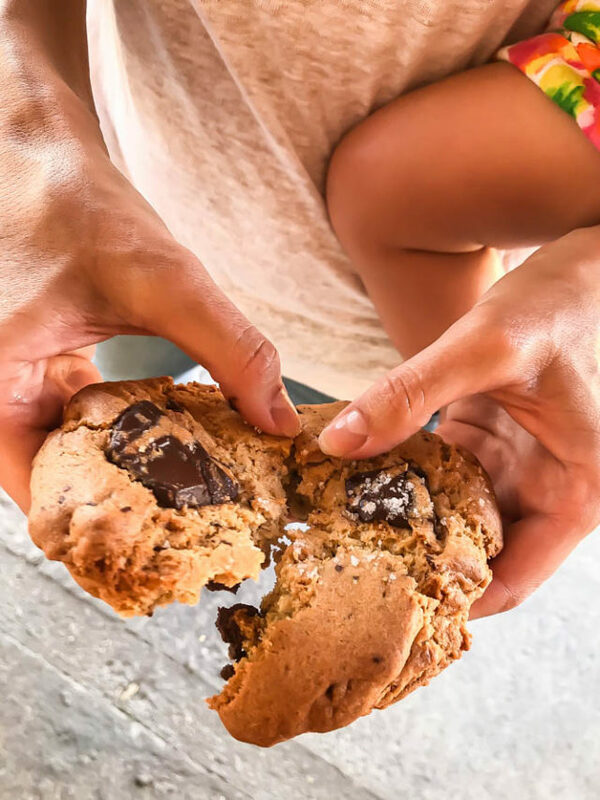 Be sure to spend some time browsing through the cute shops curated by local artists, and go hungry so you can fill up on Kickshaw’s and Fresh Shave! 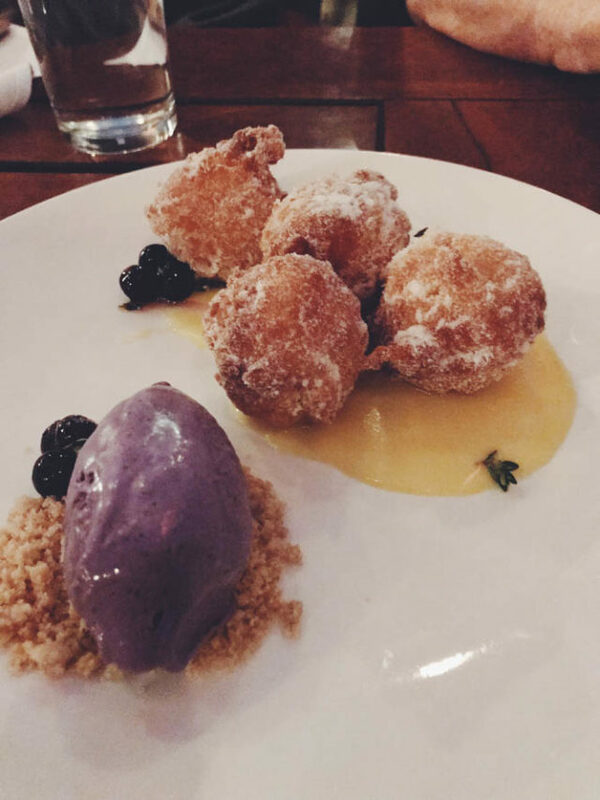 Roy’s Eating House 1849 – If you’ve ever been to Hawaii, you’re undoubtedly familiar with one of its most famous celebrity chefs, Roy Yamaguchi. 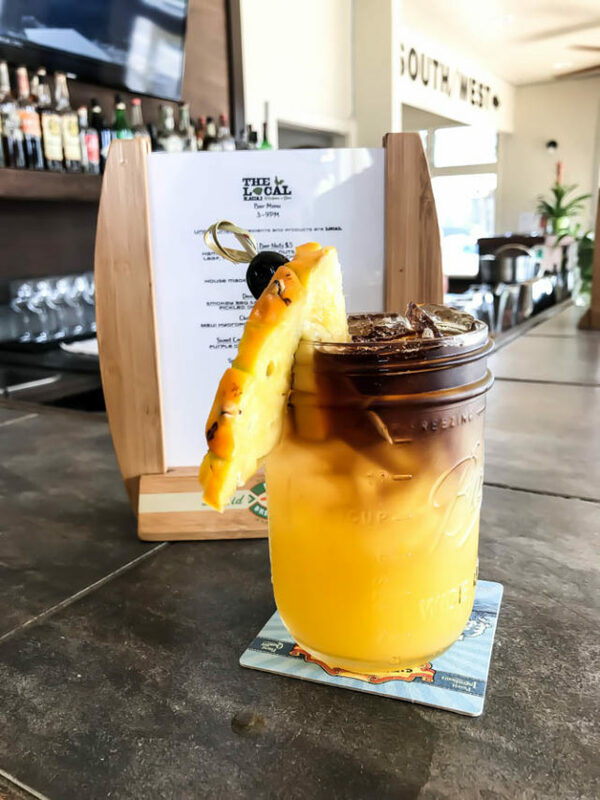 Eating House is one of his newer ventures, harkening back to the old days of Hawaiian cuisine. My fish dish was pretty darn good, but the real star of the show was the hubs’ enormous bowl of ramen. Next time we’ll know to share! 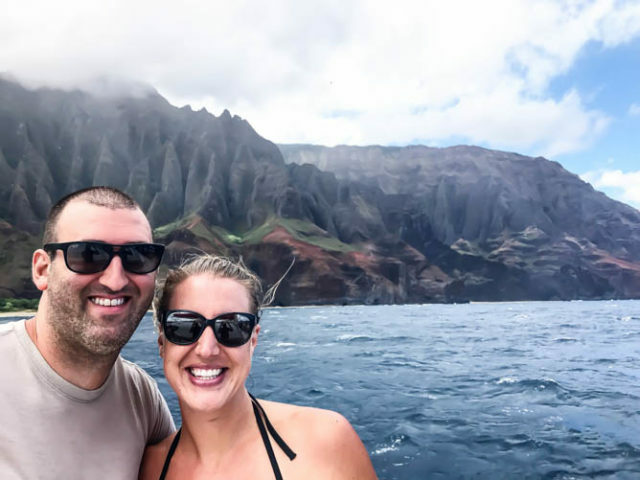 Captain Andy’s Charters – If you’re going to do any sort of sightseeing adventure in Kauai, I HIGHLY recommend a cruise up the Na Pali Coast. 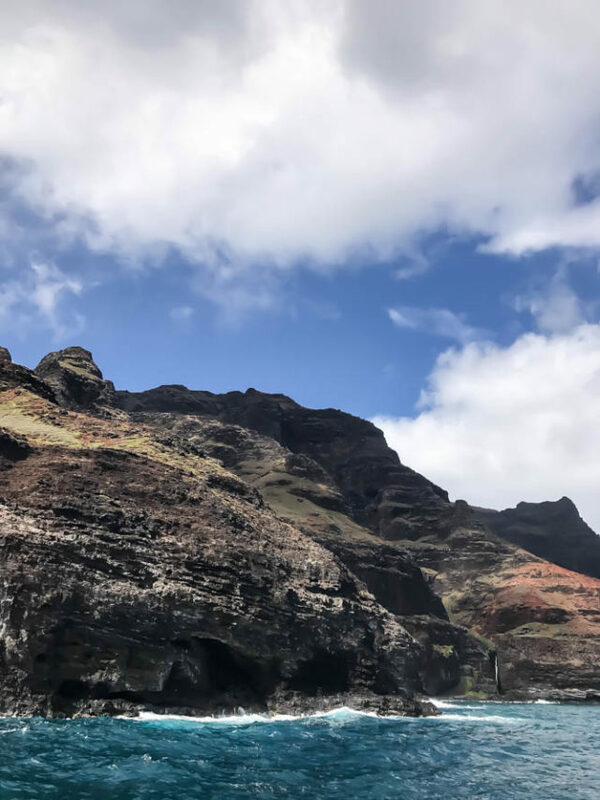 If you’re not familiar with it, the Na Pali Coast is the breathtaking, fairly uninhabited west shore of Kauai that has been the set of many popular movies such as Pirates of the Caribbean, Jurassic Park, etc. The only way to access/see it is by (a) helicopter, (b) an 11-mile hike, (c) kayaking in or (d) a boat charter. 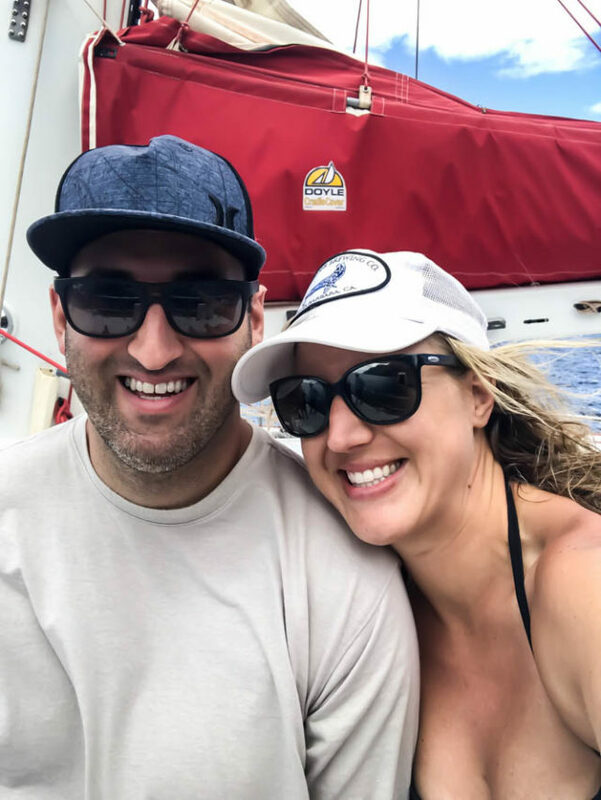 We decided on the preggo-friendly boat charter and were so glad we did! 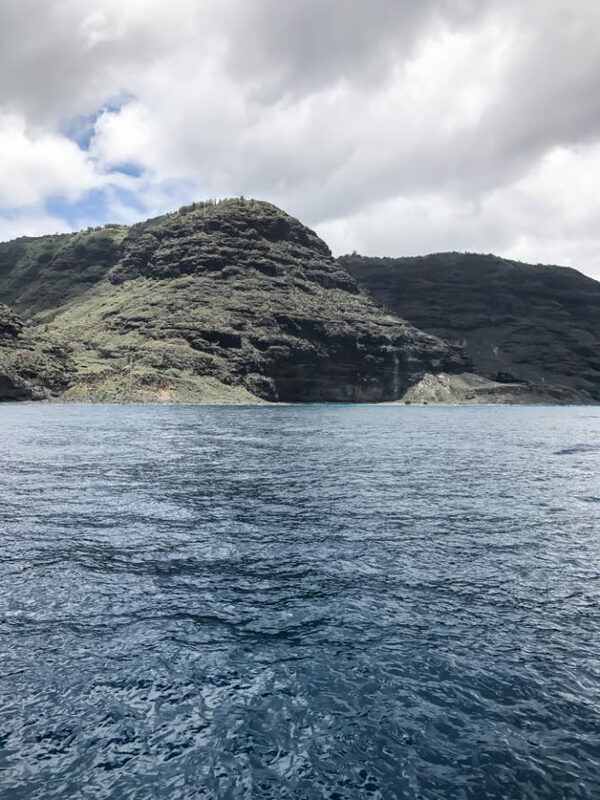 We chose the daytime Na Pali Snorkel Picnic Sail with Captain Andy’s and it was just perfect. 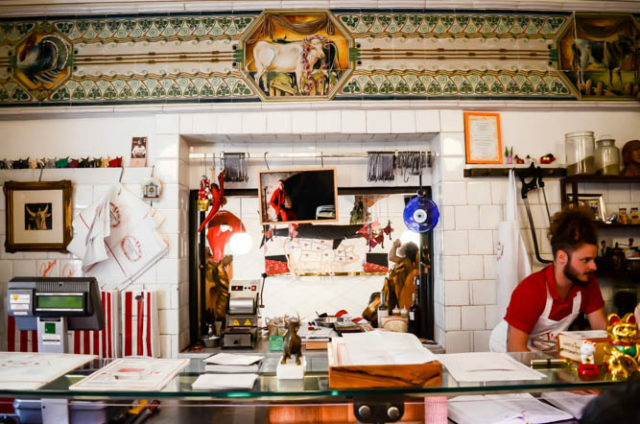 They serve you breakfast and lunch (with all their food made fresh in their own kitchen that morning, straight down to the sandwich bread…so good!) and after touring up the coast, they anchor off and let you snorkel right at the base of those massive cliffs. Quite the unforgettable experience! Just be prepared to get wet 😉 We were absolutely soaked in salt water by the end! And that’s our trip in a nutshell! Tell me, did we miss anything? We’ll undoubtedly be going back, so please tell me what we need to hit the next time around! 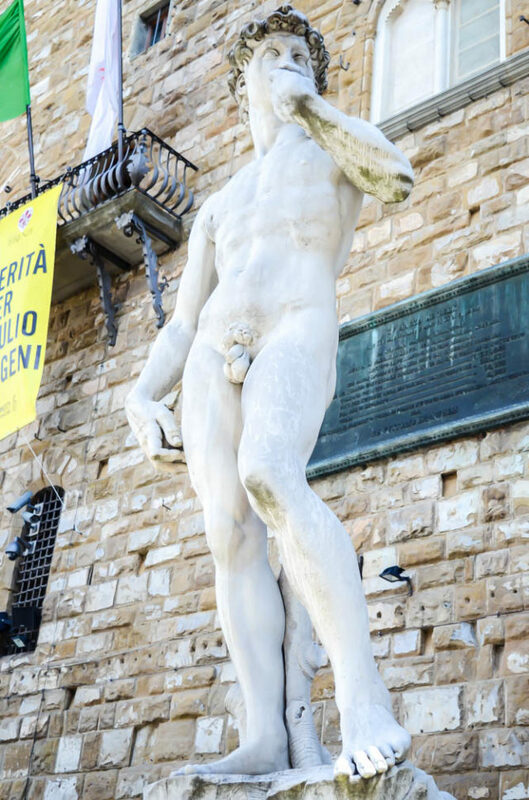 We’re kicking off the week with another travel post! 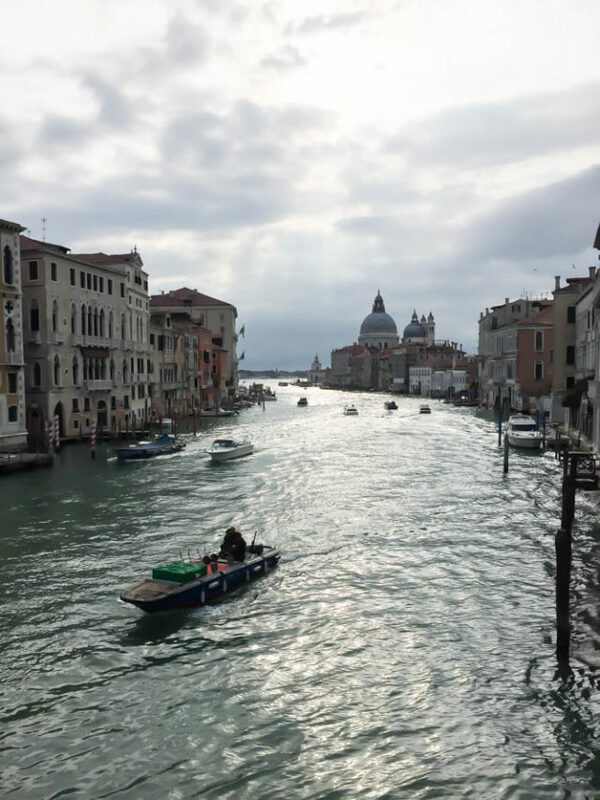 A couple of weeks ago I told you all about the first portion of our Italy trip in my Travel Diaries: Tuscany post, and today it’s time for me to tell you all about our second leg, Venice! I had been to Venice before, but no one else in the group (except my Aunt Carol) had. 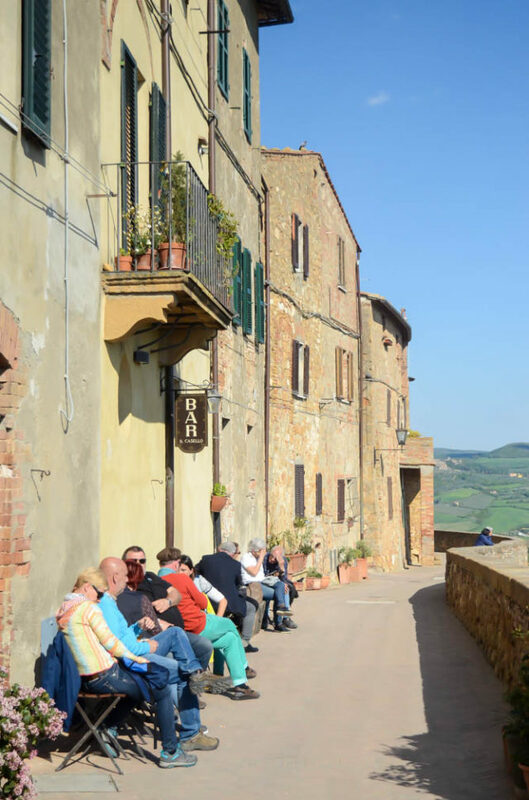 As we all know, it’s an unforgettable town and, albeit overly crowded most days out of the year, it’s a place you definitely have to visit at least once in your lifetime (and before it sinks!) 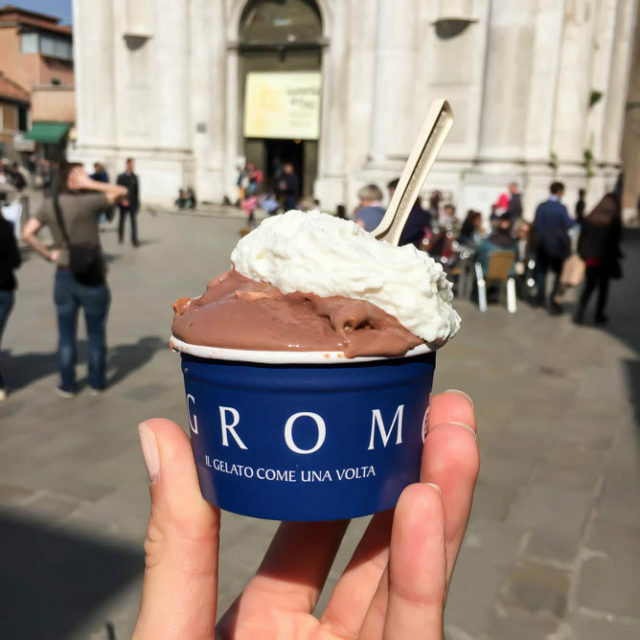 When I found out Venice was only a two-and-a-half hour train ride from Florence, I knew this would be the perfect place to break up our trip. So, without further ado, here are all the deets! Since we were traveling in a group of seven, we decided it would be most economical to rent a multi-bedroom apartment that could accommodate us rather than having to book upwards of four separate hotel rooms at any one establishment. 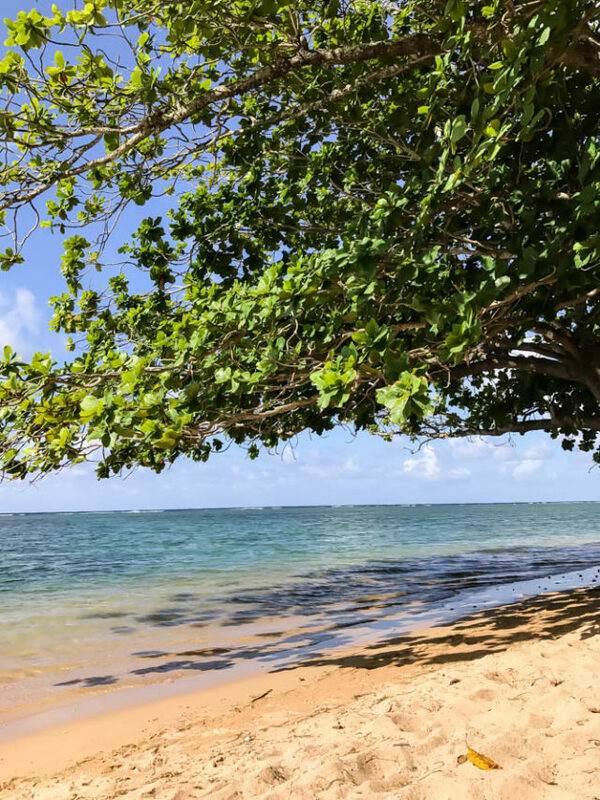 In all of our travels, we’ve found that AirBnB’s (our other vacation home rentals) are by far the cheapest option when vacationing with a large party. 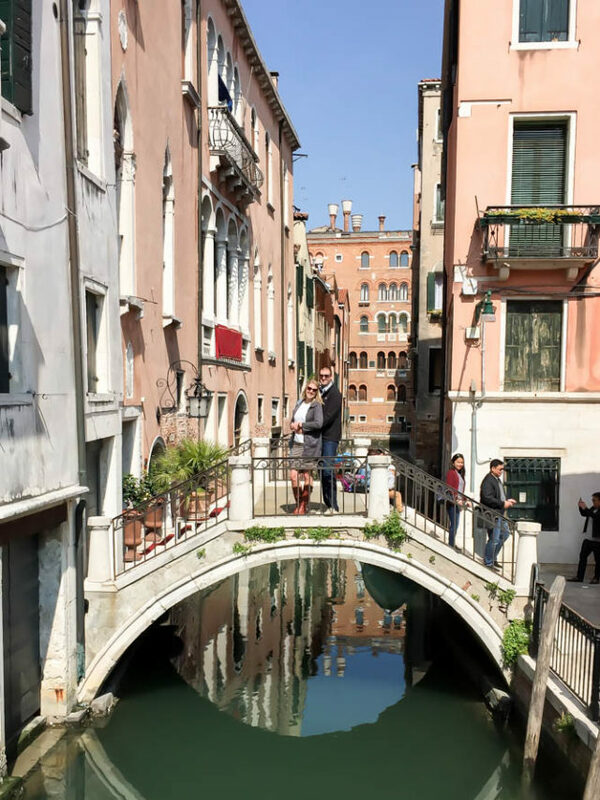 We ended up finding this five bedroom apartment in the Dorsoduro region of Venice, which I must say was pretty ideal location-wise. 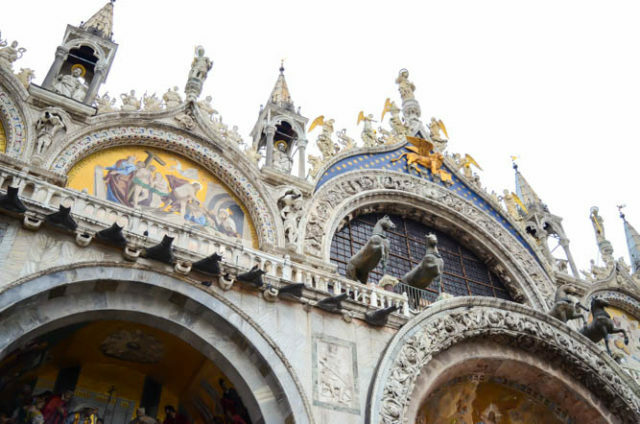 It’s not a super-touristy area, but only about a 15-minute walk away from all of the city’s hot spots, like the Piazza San Marco. The apartment itself had tons of old-school charm, not new and updated by any means, but hey, major points for showers larger than the typical submarine-like Euro showers you see most places. One thing to keep in mind when renting a Venice apartment is that often the “first level” is actually the second level. Due to the frequent flooding, there are really no residences on the ground floor. The narrow flight of stairs up to the apartment was a little challenging for some in our group (bad knees abound) but we managed. Also keep in mind that Venice is not very handicap accessible, and you will not likely find elevators in any of these apartment buildings. Okay, on to what we did and, more importantly, where we ate! 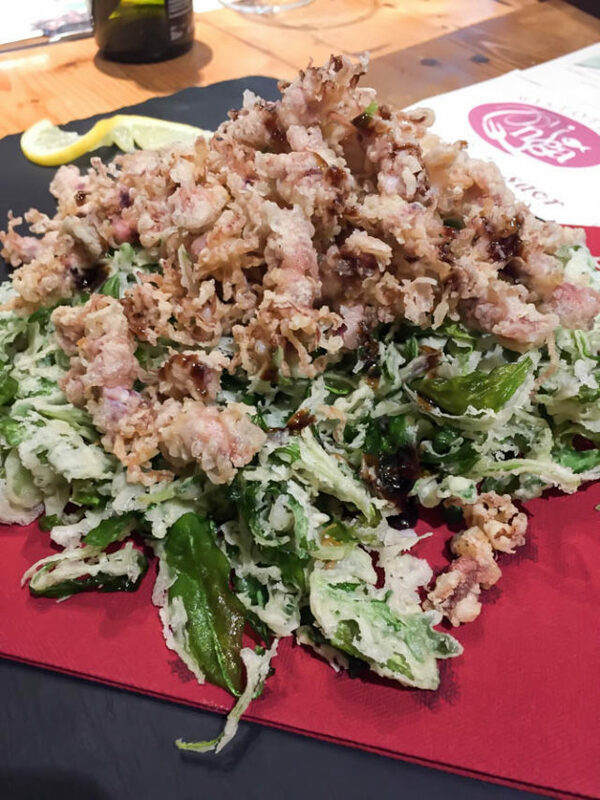 We stopped here for lunch one day (it was recommended by our AirBnB host) and I just have one thing to say about it – calamari. It came as a huge serving and was fried in the lightest, airiest batter. They even fried the arugula they served it over! 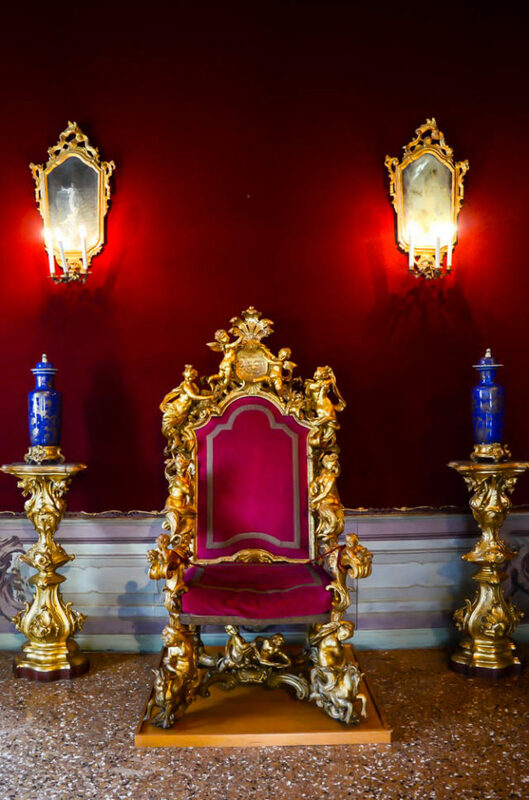 We visited this museum of 18th century Venice per my mom’s request and I have to say I was unexpectedly impressed. 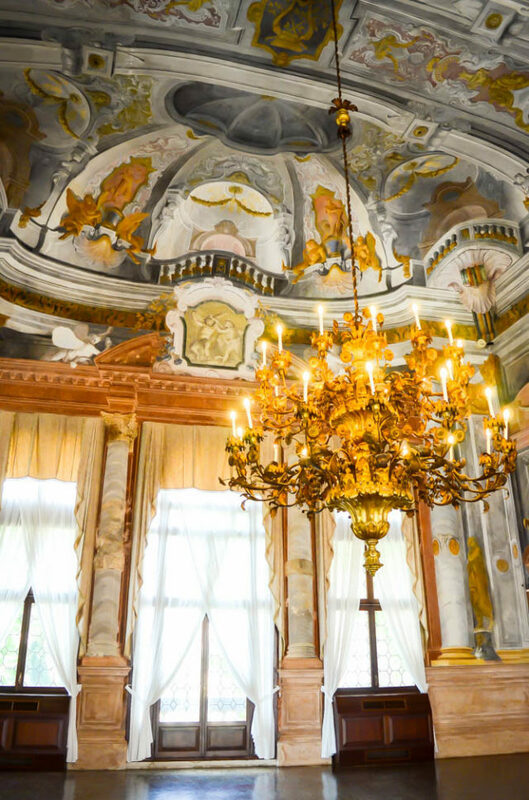 It’s basically an old palace that you can walk through with gorgeous frescoes and furniture, different themes in every room. 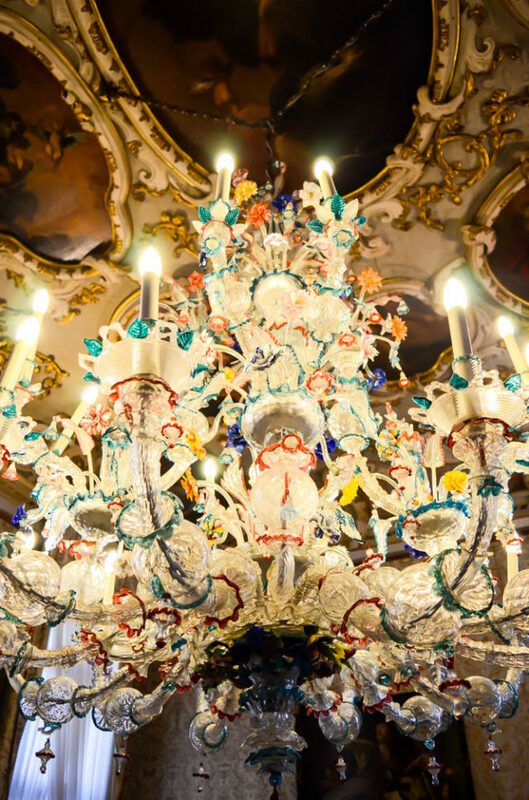 We saw some of the prettiest blown glass chandeliers here! We settled on this restaurant after searching Yelp for something on the water very nearby to our apartment (some in the group were a little weary from exploring all day.) 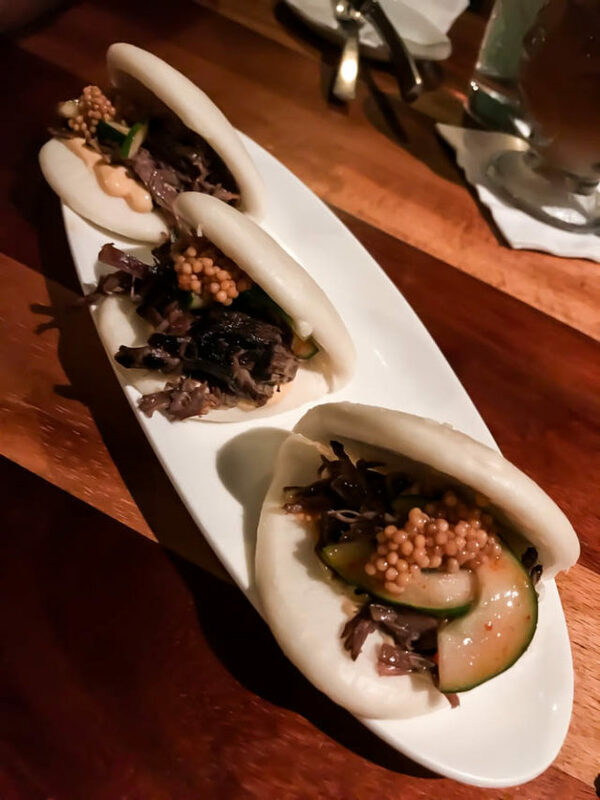 Although there was no outdoor seating and there was a small miscommunication with our reservation, the servers were incredibly nice to accommodate us and I must say the food was amazing. A bit pricier than most of our other meals, but in my opinion it was worth it! 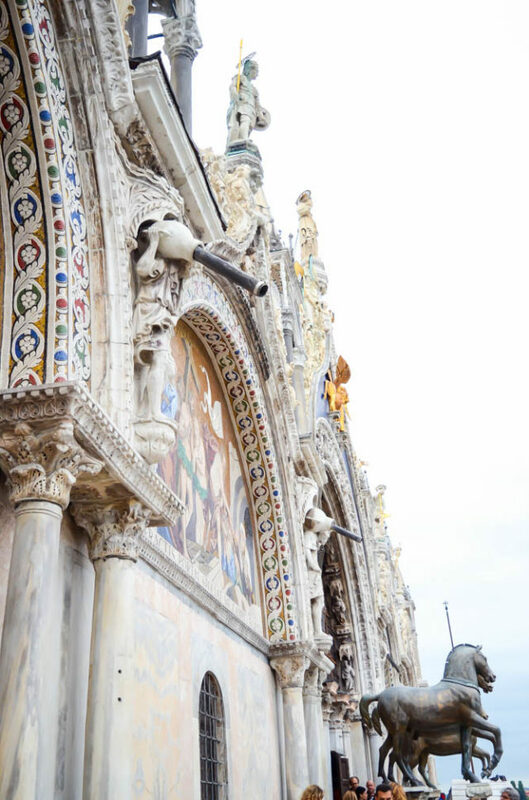 Be sure to visit the Loggia dei Cavalli when touring the Basilica di San Marco. This is the huge terrace that overlooks the entire square and is flanked by a herd of bronze horses. Truly breathtaking! 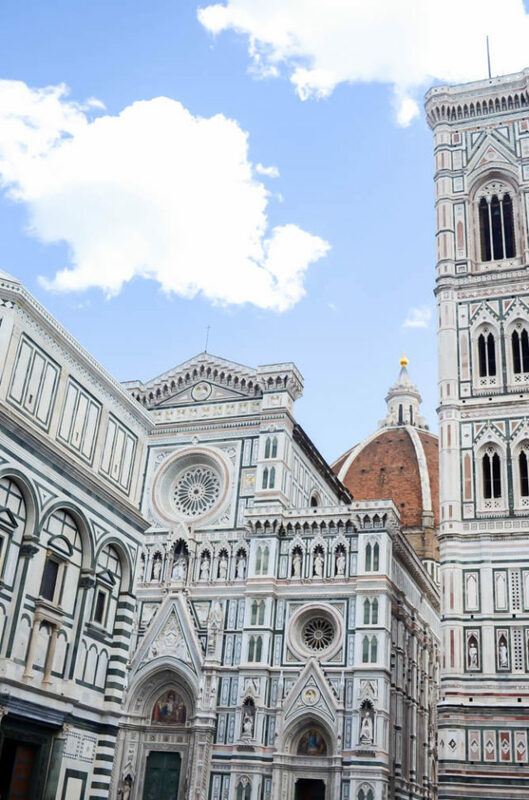 Aside from these highlights, we really just wandered around, stopping to eat gelato, shop, and pop into random places that caught our eye whenever we felt like it. 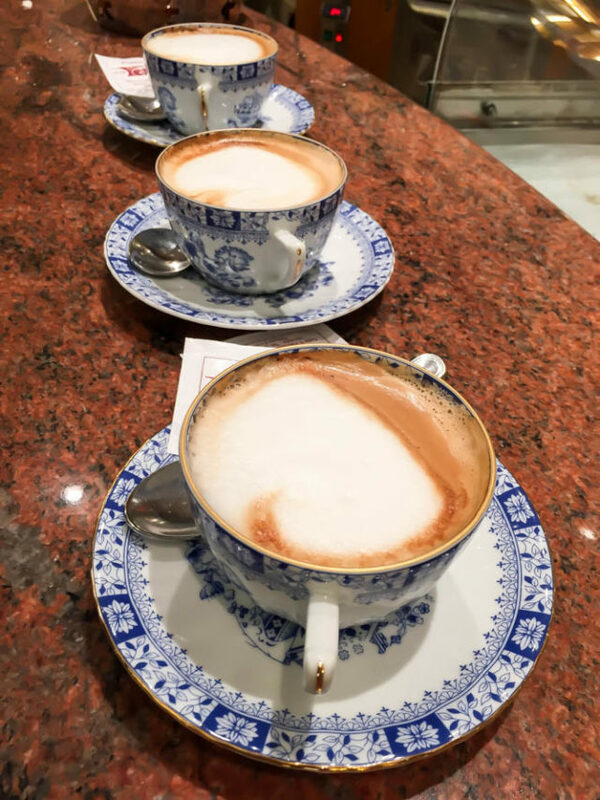 Cappucinos and doughnuts/croissants every morning were a “must” as well. One thing I would say about Venice (which you may guess from my recap) is to not go into it with a strict schedule. 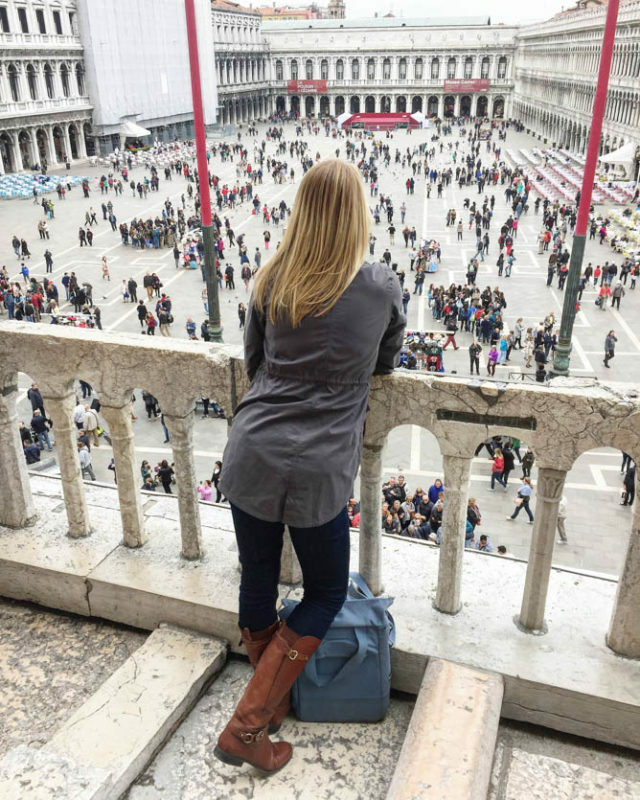 We planned to arrive at Piazza San Marco right when the Basilica opened so we wouldn’t have the WORST crowds or have to stand in an ultra-long line, but that was really the only thing we had planned. It’s such a busy city with so much going on that sometimes it’s best to just go with the flow and see where the wind (haha I just accidentally typed wine) takes you. 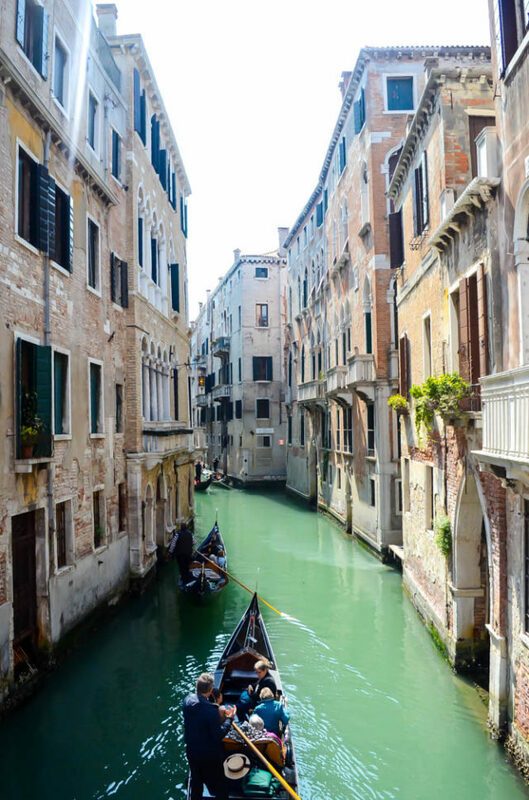 Tell me, have you been to Venice before? What did we miss? 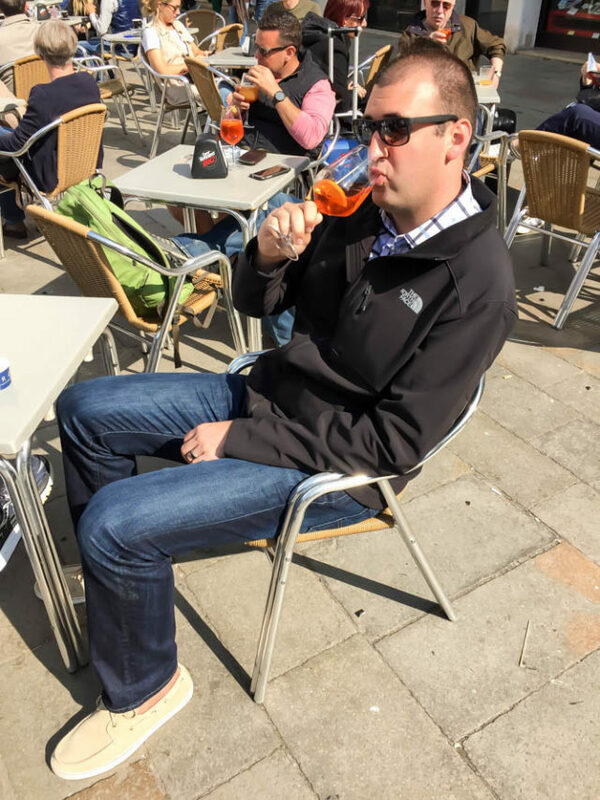 So are you ready to hear all about my trip to Italy? I hope so, because I’m so excited to tell you about it. 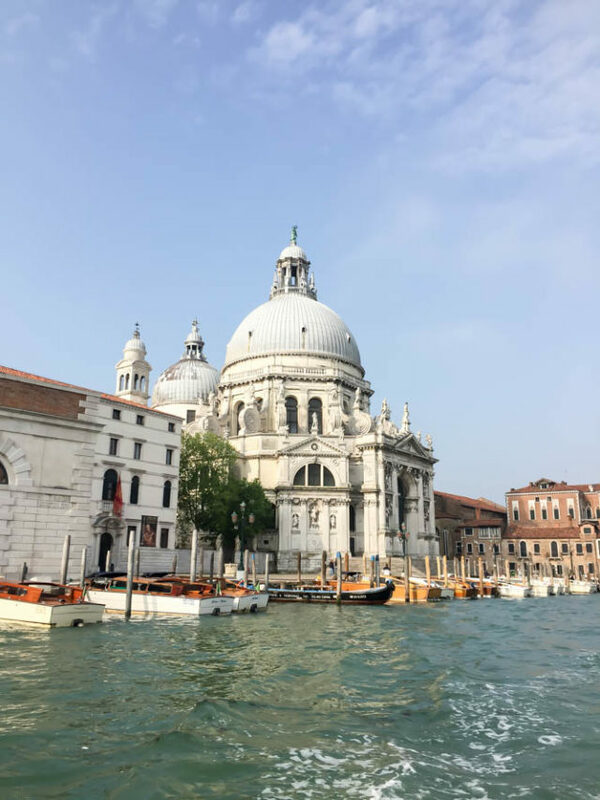 And because we basically split our trip into two parts (five days in Tuscany and three days in Venice) I’m going to break it down into two posts for you. This will also make it easier for you to find all my recommendations when you’re planning your next trip to either of these areas! 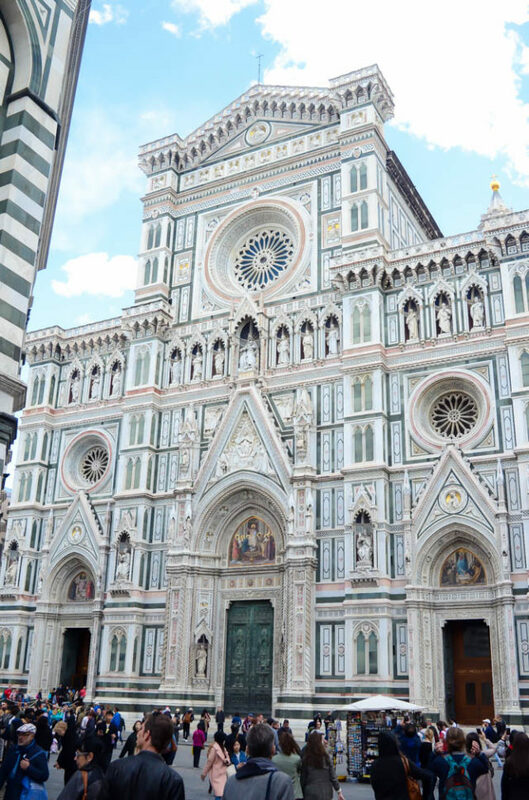 First off, it’s been far too long since my last Travel Diaries post. It’s been just about five months, in fact, since I brought you my Travel Diaries: Quebec City. We slowed down a bit in the New Year, after the craziness of the holidays, our wedding, and a ton of travel in between. 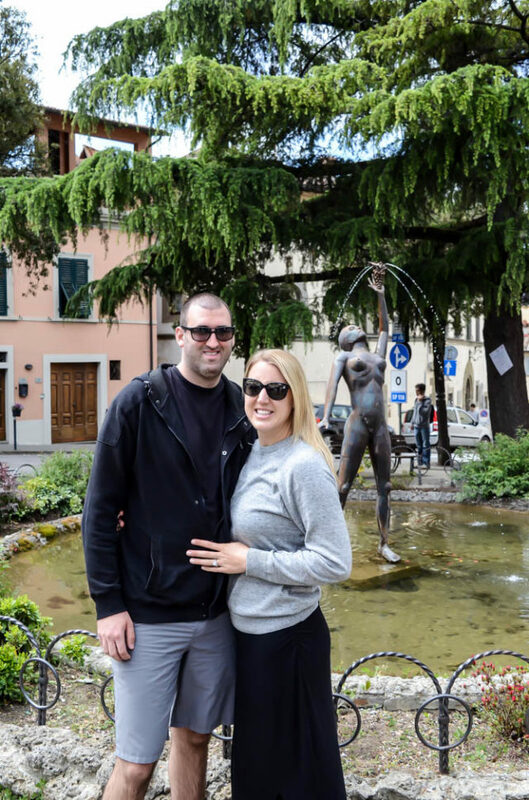 We were also saving up vacation time for this big trip to Italy, which made it just a little bit easier to stay put knowing we had it to look forward to! 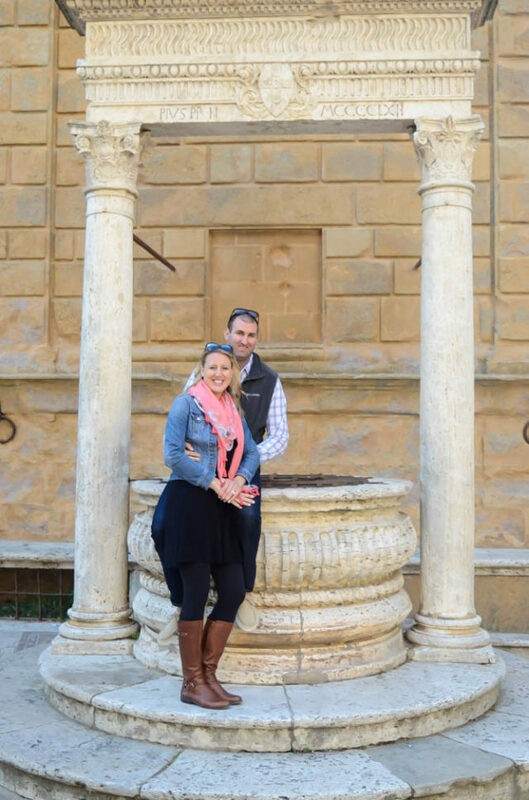 So, without further ado, here are all the deets for the Tuscany portion of our trip! 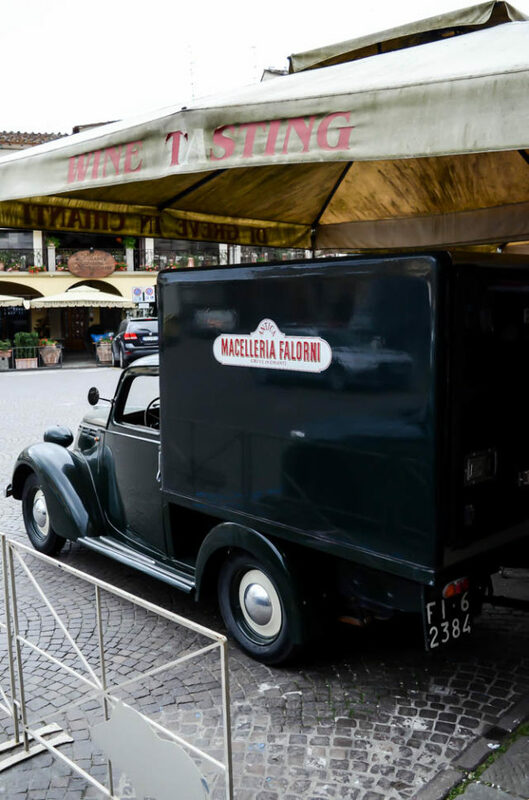 For this first portion of our trip, we parked our luggage at the beautiful, historic Villa Fabbroni. 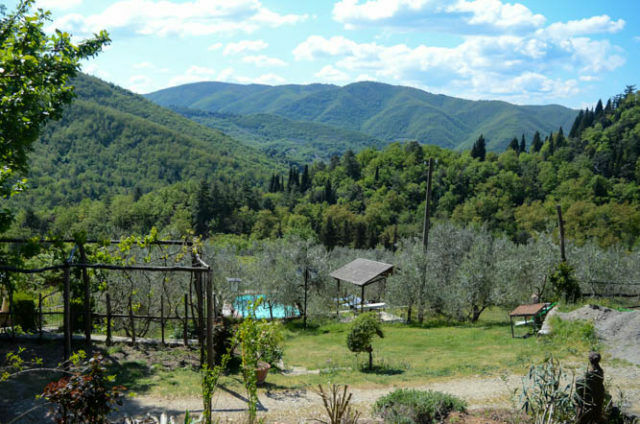 Now, I may be biased, but if you are traveling anywhere in the greater Tuscany area, I highly recommend that you stay here. 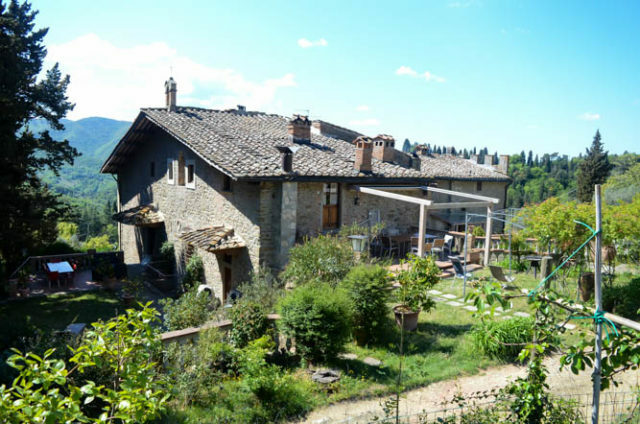 We found it thanks to friends of friends of friends, and the owners, Sergio and Stefano, quickly became dear friends of ours after my aunt and I first visited their property back in 2013. 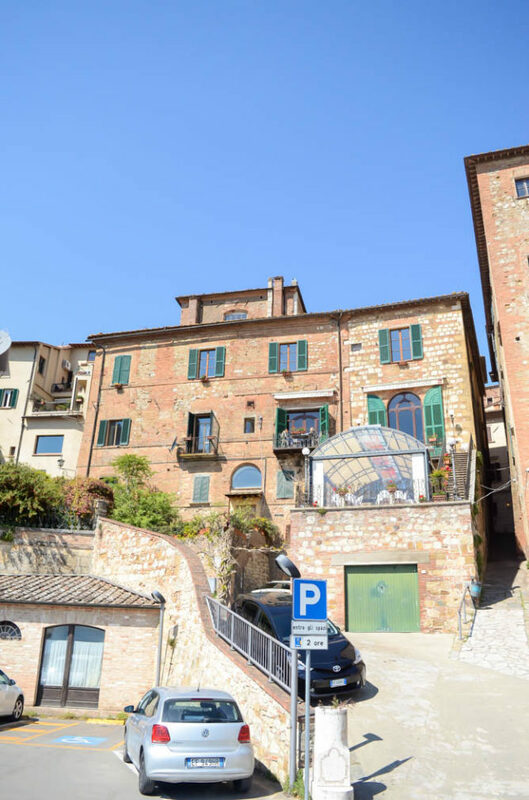 Think of Villa Fabbroni as a huge step up from your average AirBnB. 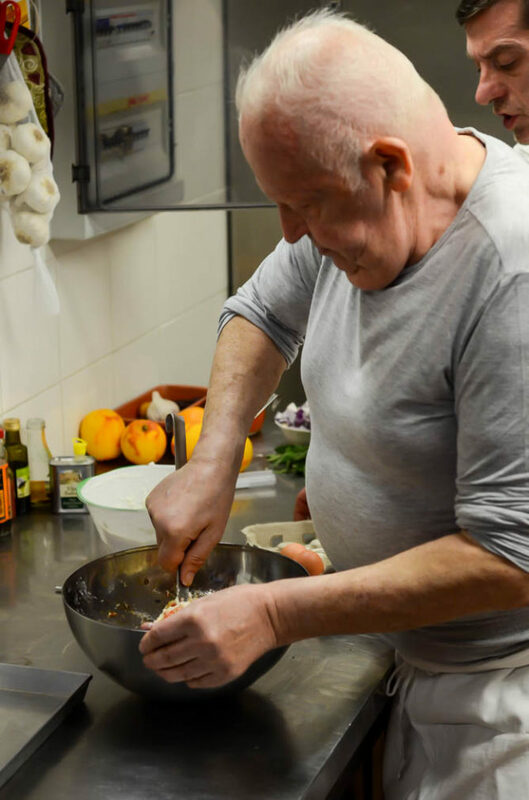 You can’t expect all of your average hotel amenities or daily maid service, but you CAN expect delicious meals prepared for you daily by Sergio and Stefano themselves (unless you opt to cook for yourself in your apartment’s kitchen,) as much estate wine and olive oil as you can manage, and the quiet, relaxing and friendly atmosphere of a country villa. 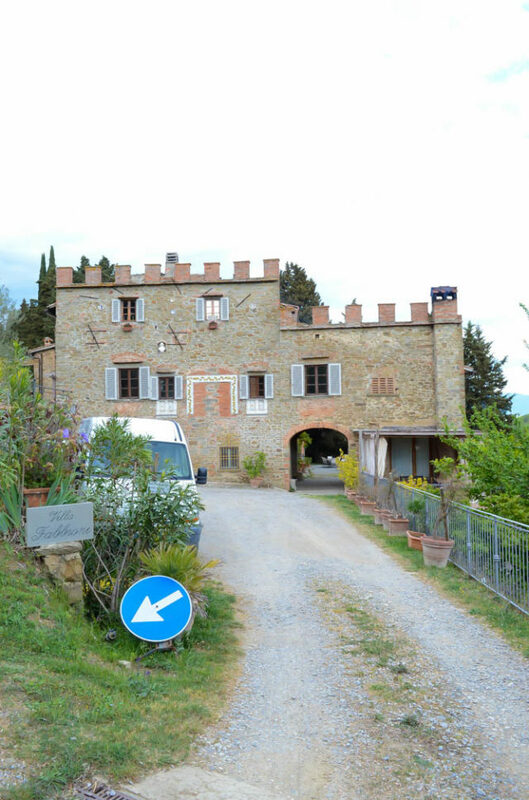 The villa is located just outside of Greve in Chianti, so if you are planning to do any exploring of the Tuscany area during your stay, plan on either renting a car (if you feel comfortable navigating windy country roads in a manual) or hiring Sergio and Stefano (if they’re available) to chaffeur you around for the day. Seeing as we had a group of seven and the guys had a big enough passenger van to hold all of us, we opted to have them show us around and are so glad we did. 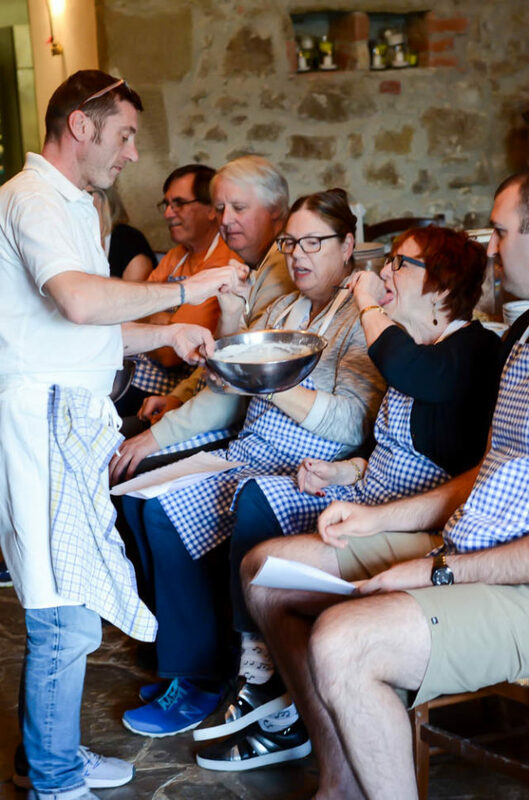 I’ll go into more detail about each of the little towns we visited below, but first I want to tell you about our cooking class! 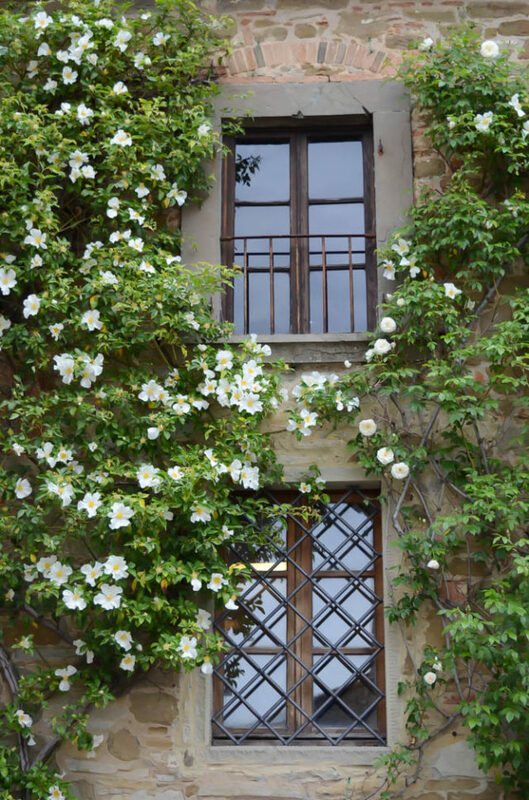 The last time my aunt and I visited Villa Fabbroni, the group we were with had jam-packed all of our days with off-site adventures, so we really didn’t have any time at the villa. 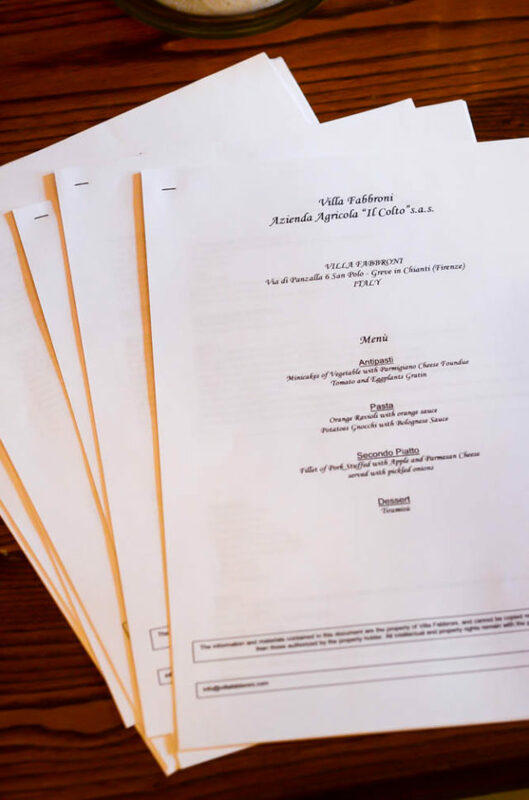 However, one night we were treated to a delicious four-course meal (as just about every dinner in Italy consists of this many courses….so much food!) prepared during a cooking class that Sergio and Stefano had hosted for another group staying on the property that day. 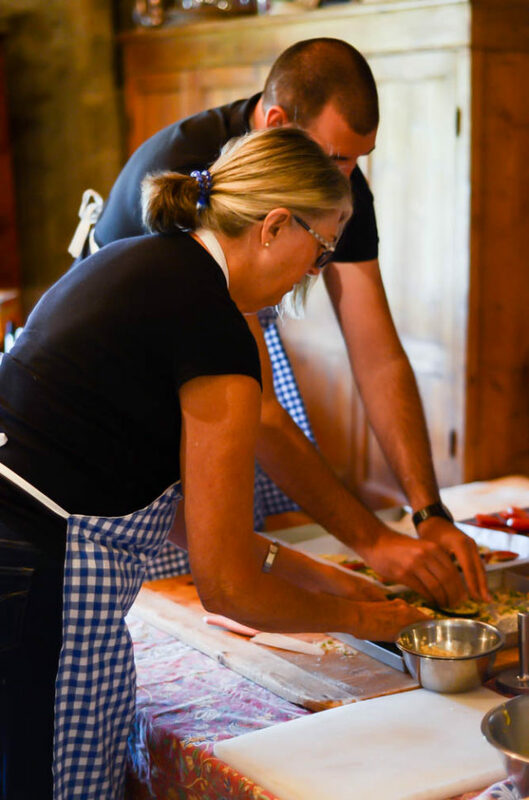 As soon as we found out that S&S offered cooking classes, we knew we wanted to take advantage of it the next time we visited. And take advantage we did! 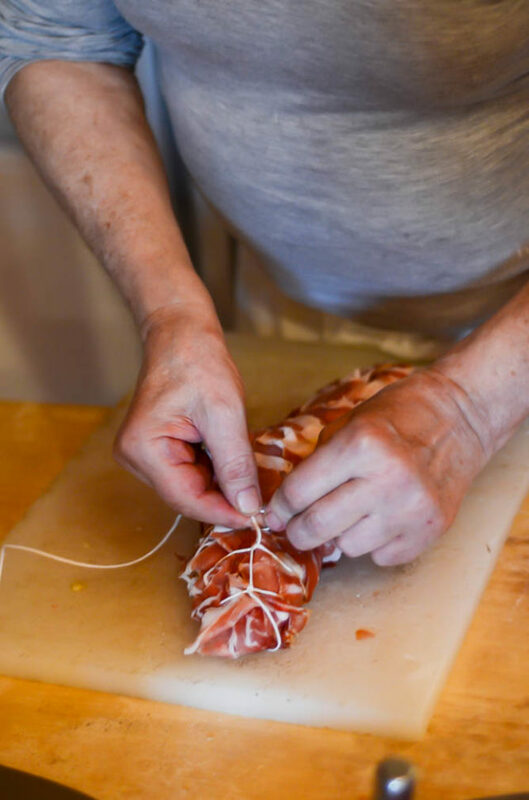 When we were planning our trip this time around, we made sure to block out a day to stay at the villa so we could spend the afternoon learning all of the regional cooking methods from two legit Italians. Guys, it was amazing! 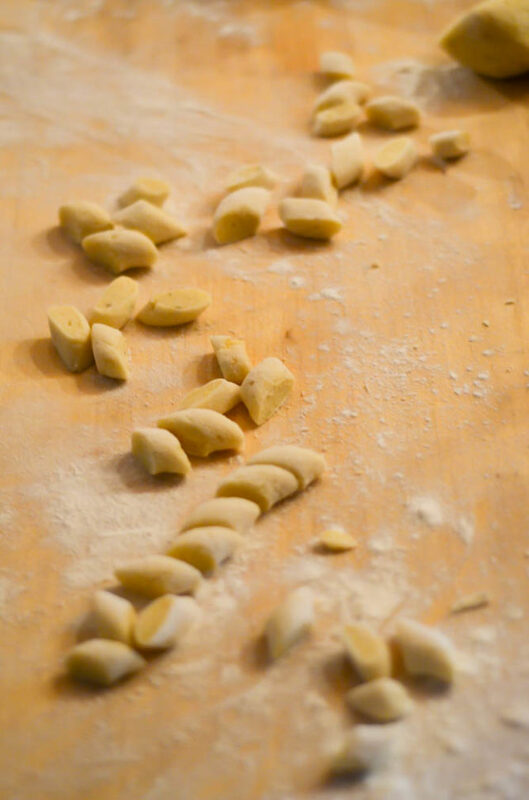 So much fun and I can’t wait to recreate some of the recipes we made and share them here on the blog. We made antipasti, gnocchi, bolognese, ravioli, and THE BEST stuffed pork tenderloin. Oh, and did I mention tiramisu? We seriously learned so much from them in just a few hours. 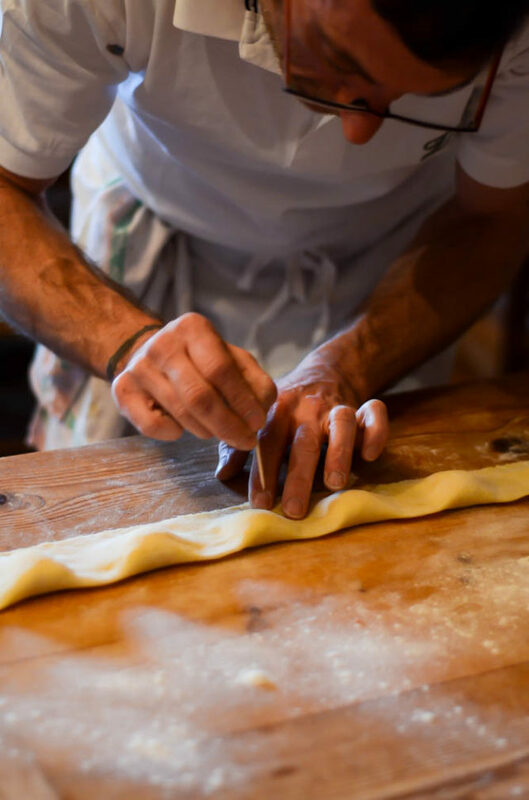 So if you stay here, DEFINITELY book a cooking class! You will not regret it one bit. 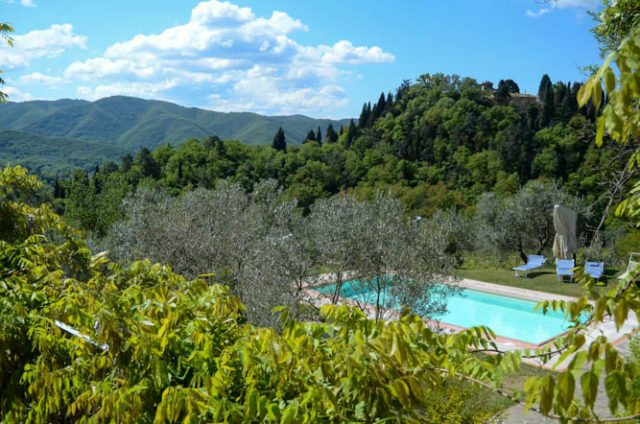 Okay, enough about the Villa (although can you tell I can’t say enough good things about it?) Let’s talk about all of the other places we got to visit during our stay! This quaint hamlet was quite sleepy and quiet when we visited, due to it being a largely agricultural-based town and it not quite being “farming season” yet. 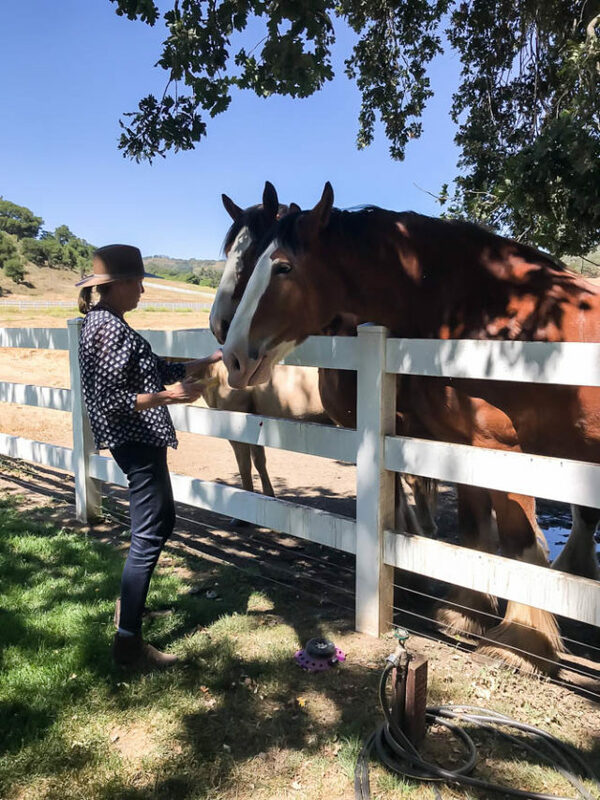 Sergio informed us that, in a few weeks, its seasonal residents would start trickling in and getting ready for the harvest season ahead, which lasts until about mid-October. 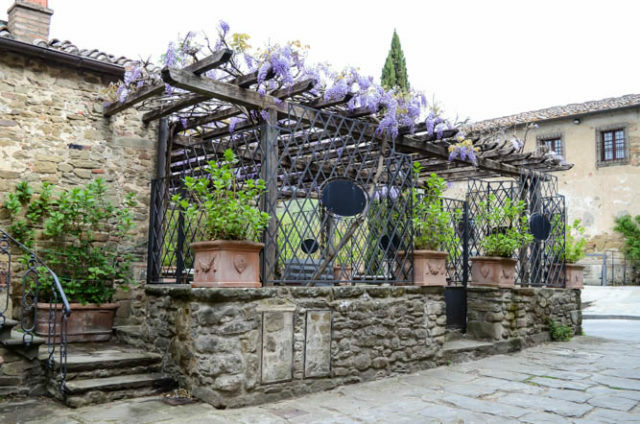 We were, however, able to purchase some of the city’s famous wine which we promptly enjoyed back at the villa that afternoon. 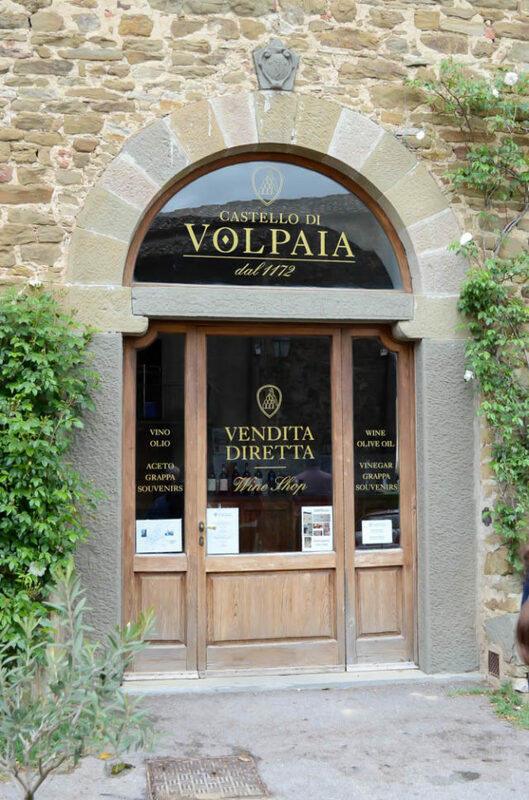 Another quiet little town, albeit a tad busier than Volpaia as there are more year-round residents. There’s nothing incredibly significant about this area, but it’s sheer calmness and nearly empty streets made it that much more magical, and made for lots of great photo ops! Don’t mind our disheveled look 😉 Our luggage was delayed so we were working with whatever we had in our carry-on! 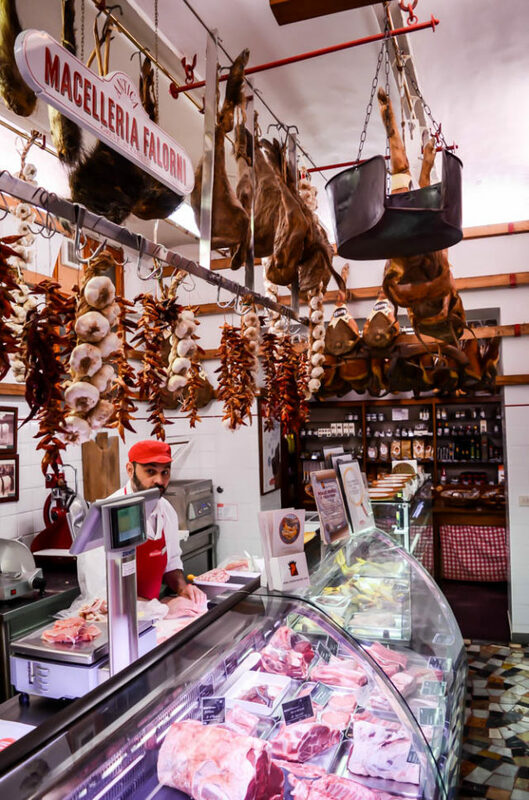 This was a MUST visit for me as we had gone on our last trip to Villa Fabbroni and I had absolutely fallen in love with two things there: the butcher and the wine shop of course! 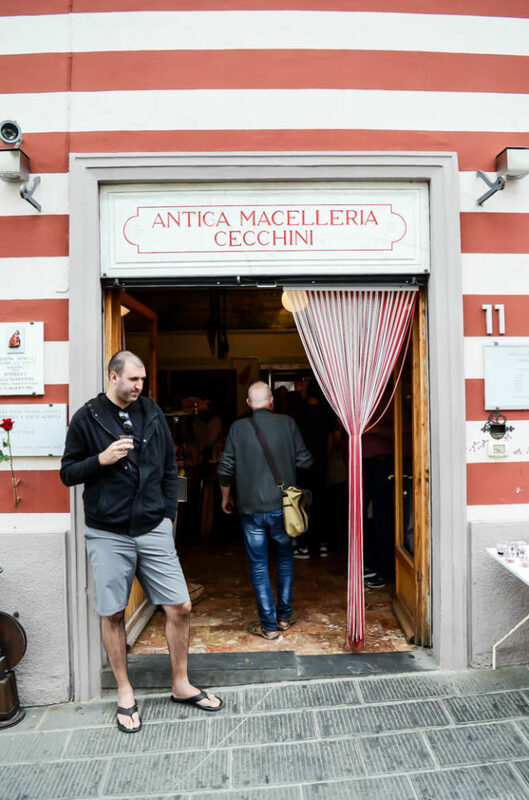 If you’re anywhere near Panzano during your Tuscany travels, you MUST stop in at Antica Macelleria Cecchini to get a taste of a TRUE Italian butcher. 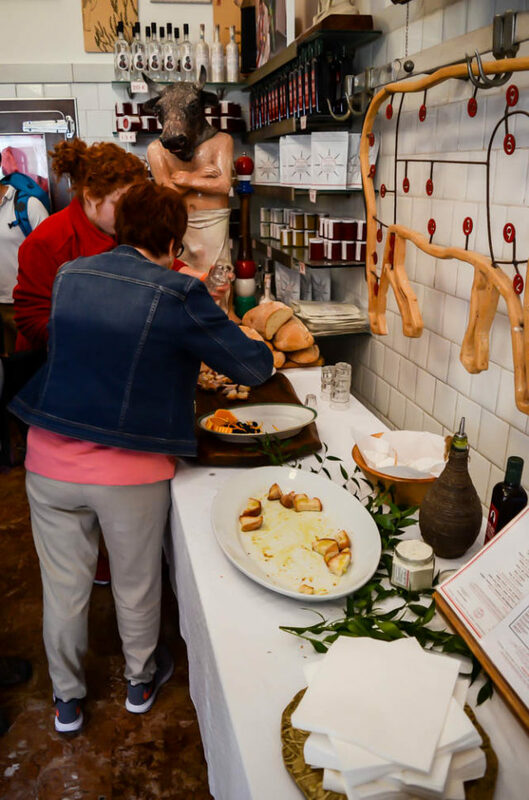 Complete with a glass of house wine when you walk in, a buffet loaded with samples of their seasoned salt and house lard spread on crunchy baguette, and music blaring from the speakers, this is a super-fun stop that you will NOT want to miss. 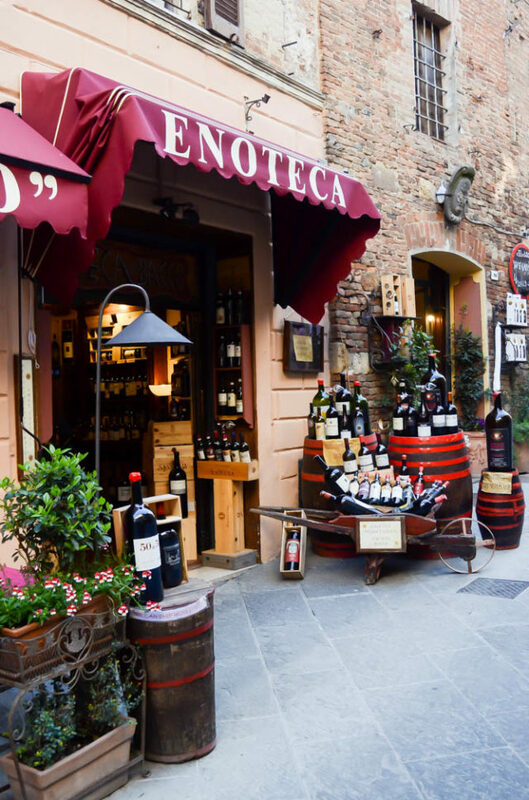 The other must-visit in Panzano is the Accademia del Buon Gusto, where you will have a wine-tasting experience like no other. 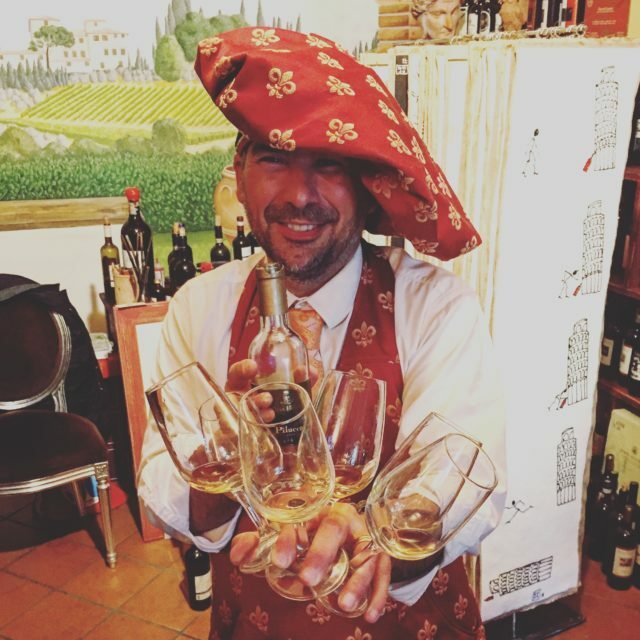 Stefano (not the same Stefano that runs Villa Fabbroni, although they are in fact good friends) is the quirky, passionate owner who will take you on a journey through all of the vineyards of Tuscany and beyond, in just his little, stuffed-to-the-gills wine shop. 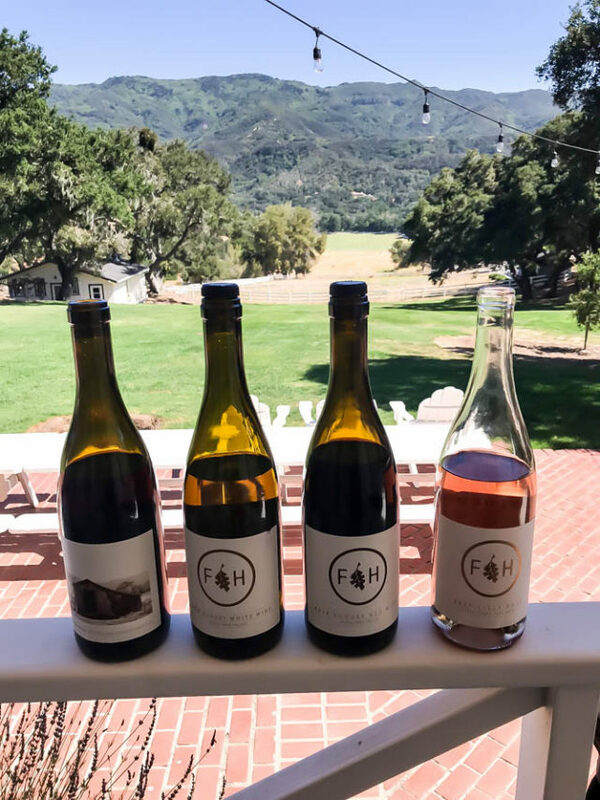 He relates many of the wines he tastes to stories depicted on canvas by a local artist (which he also sells,) stories that will leave you cracking up and with a hilariously memorable experience that you’ll be telling friends about for years to come. 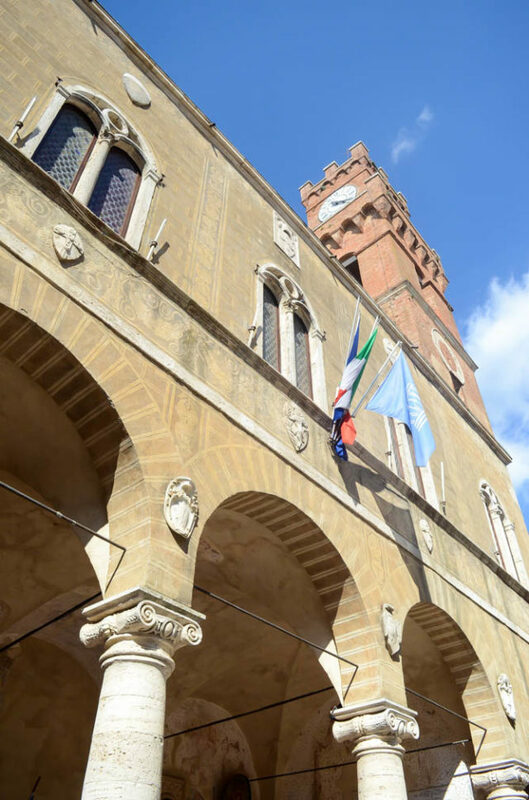 The largest town in proximity to Villa Fabbroni, although it’s really just a huge plaza surrounded by cute artisanal shops, restaurants and, of course, another butcher! Although not as lively as Antica Macelleria Cecchini, Antica Macelleria Falorni is much larger with a huge range of offerings, from freshly butchered meats to house charcuterie to a whole cellar filled with cheese, this was a great spot for us to stop on our first day and stock up on snacks to take back to the villa with us for the rest of the week. 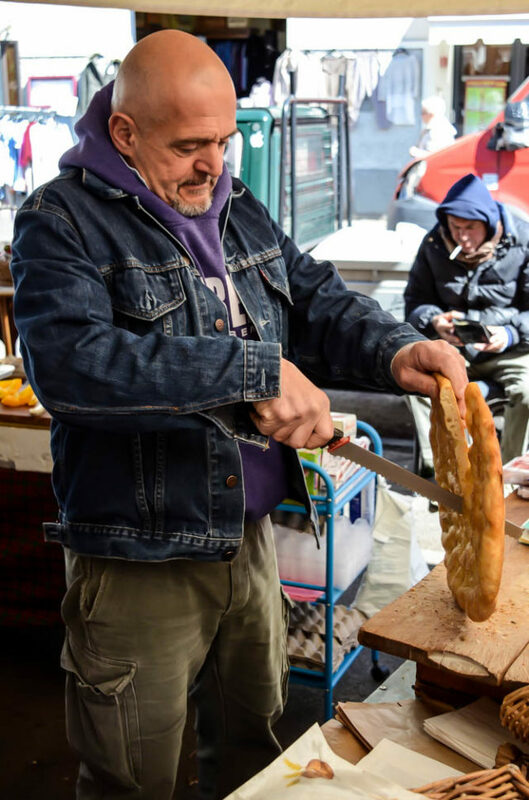 And for all you food bloggers/kitchenware snobs out there, this is also a great town to shop for unique, handmade wood pieces and beautiful Italian pottery. Just take a loop around the square and you’re bound to find something! 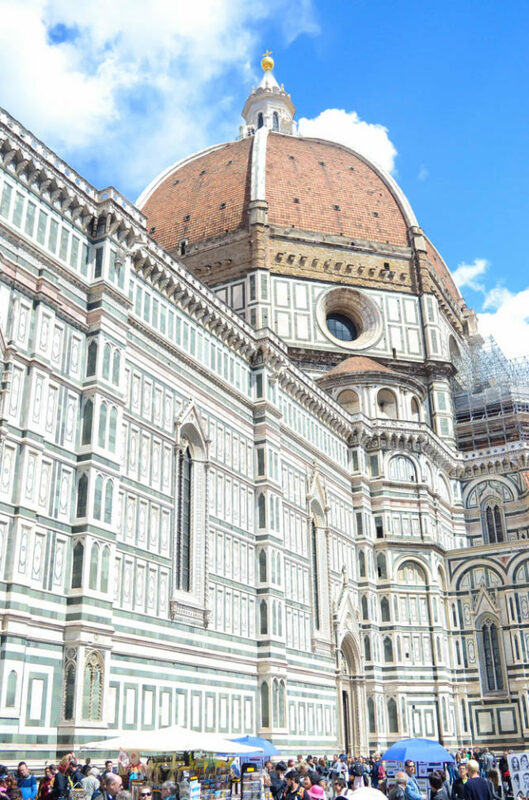 Although my parents, aunt and me had all been to Florence before, we felt it was a must-see for the newbies in our group. 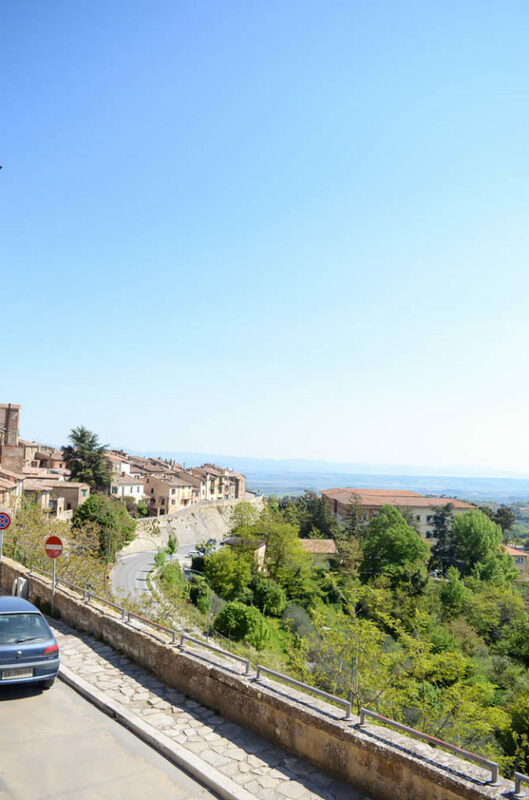 Before even stepping foot into the city, Sergio and Stefano took us up to San Miniato al Monte, a stunning church (where my aunt and I had actually attended a beautiful Mass on our last visit) with expansive views of the entire city. 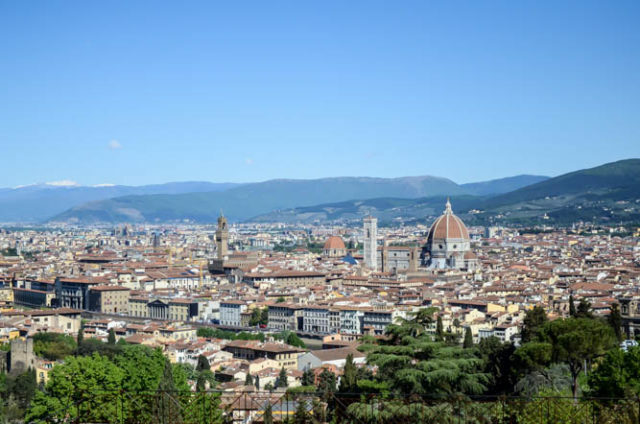 Most visitors to Florence know to go to the Piazzale Michaelangelo for these gorgeous views, but skip the massive crowds and lines of tour buses and drive a little further to the church. You’ll get the same panoramic views and less than half the crowd! 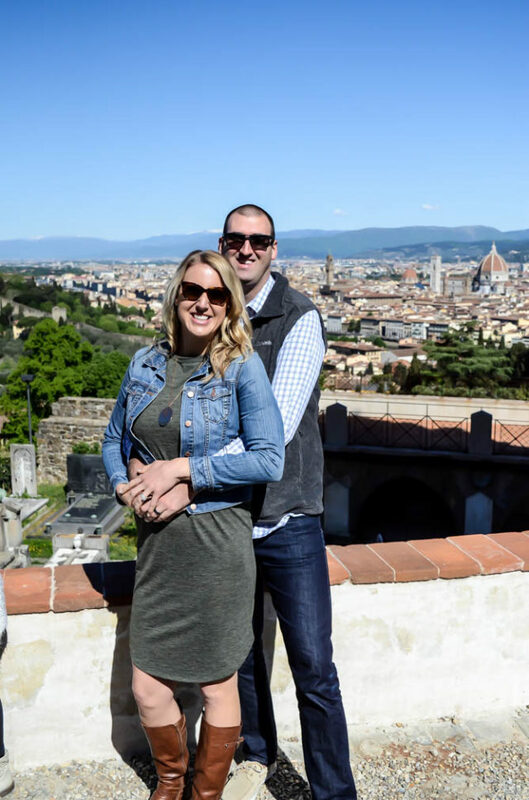 After snapping our obligatory photos of the city from above, we headed down and got dropped off right outside the city walls (you need a special permit to drive in the streets of Florence, so if you don’t have one be ready to walk!) 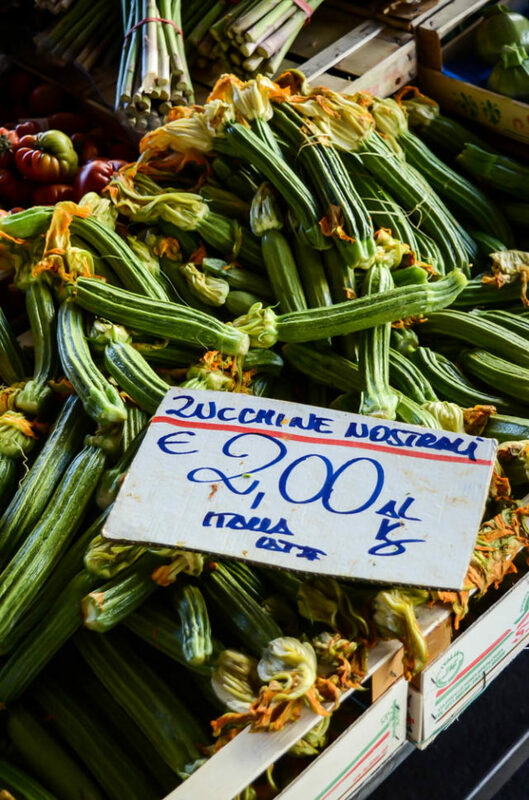 We started out at the Sant’ Ambrogio Market which is a smaller version of the well-known Mercato Centrale. 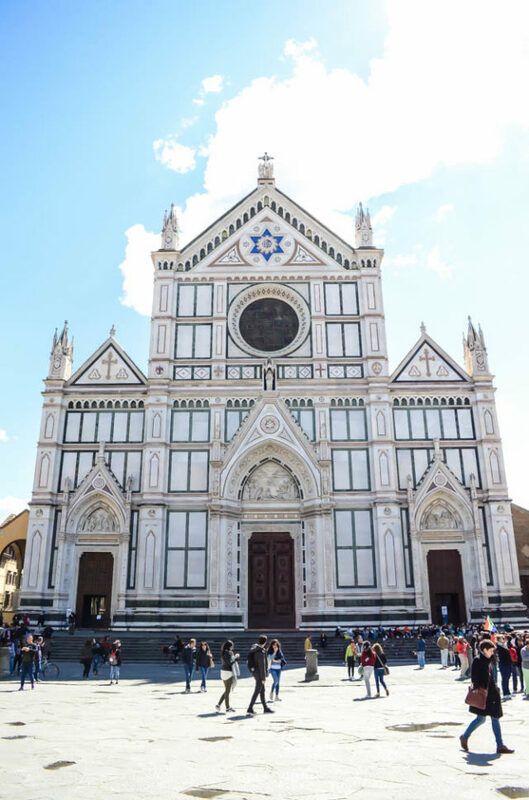 We then made our way through the city and eventually to the city center to gawk at the impressive Piazza del Duomo, where you just might end up with a huge kink in your neck from looking up at the massive, incredibly intricate architecture that looms over the city. 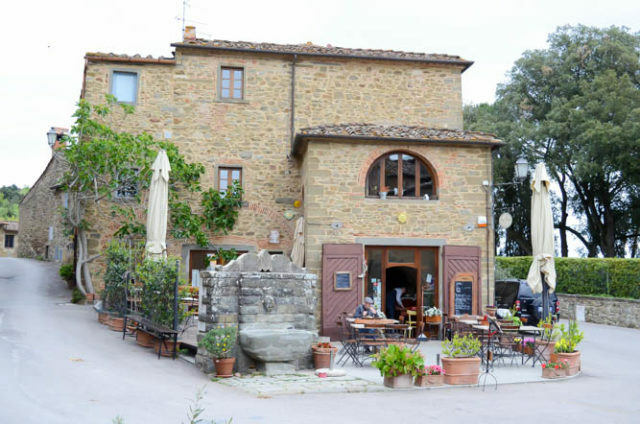 We’d worked up quite an appetite traversing the rather large city on foot, so we stopped into Antico Ristorante Sasso di Dante for a late lunch before making the hour and a half drive back to the villa. 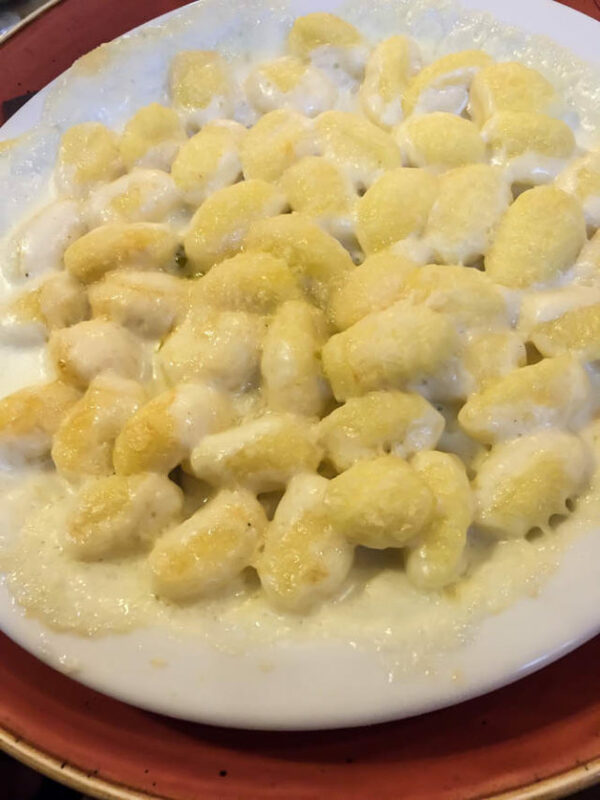 Be sure to order the broiled Gnocchi with Creamy Gorgonzola sauce. I guarantee you will NOT be disappointed. Oh! 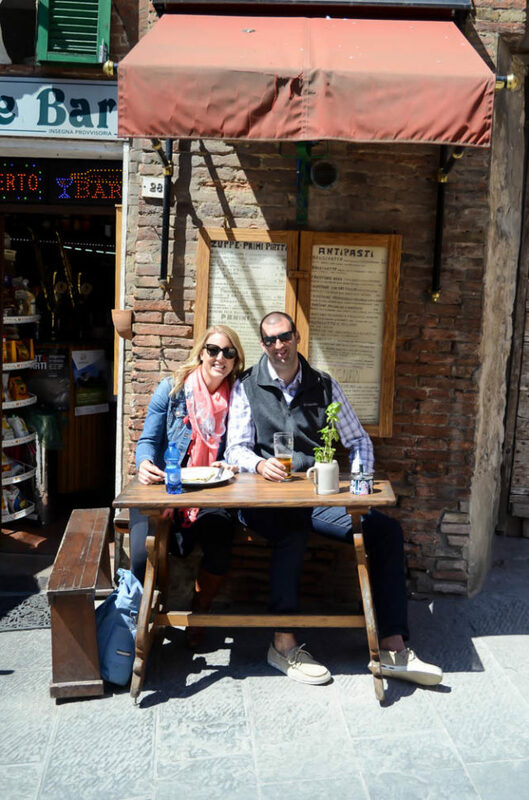 And I can’t forget what began our daily love affair with an afternoon gelato stop – right outside of Florence’s city walls, be sure to stop in to Badiani for a couple of scoops of what we determined was THE best gelato of our trip (and we tried a lot of gelato.) It’s worth trying to find a parking spot on the city streets!